Ultras? A blog on football fans known for ultra-fanatical support? Often with violent tendencies? No, this is about ultra-prominent mountains, or “Ultras”. One of the great mountaineering goals is to climb all of the Earth’s 8000m peaks. There are 14 of them. Only 40 people have ever, indisputably, climbed all 14. Everest’s South Summit lies at 8749m metres in elevation. But the list of 14 does not include it. This is the case notwithstanding the fact that there is no higher summit on the Earth’s surface, other than the summit of Everest itself. Why is this? The answer is that when descending from Everest’s main summit to return down the Nepalese side of the mountain it is only necessary to re-ascend 11m in order to pass over the South Summit. In other words this summit is a mere pimple on the side of Everest. So somewhere along the line a judgement is being made as to what should constitute a separate mountain. In the case of Everest’s South Summit that judgement is because its lack of prominence, it has insufficient definition in its own right to be regarded as a separate mountain. So should these judgements be subjective or objective? In other words should a fixed physical and measurable criterion be used to determine what constitutes a mountain (and by extension a hill)? If so, what should this be? Returning to the UK (or more accurately Scotland) for a moment, by the 1930s three hill classifications had been developed. Each used different criteria to determine whether or not a particular summit merited inclusion in the classification. The summits included in these classifications became known as the Munros, the Corbetts and the Donalds. 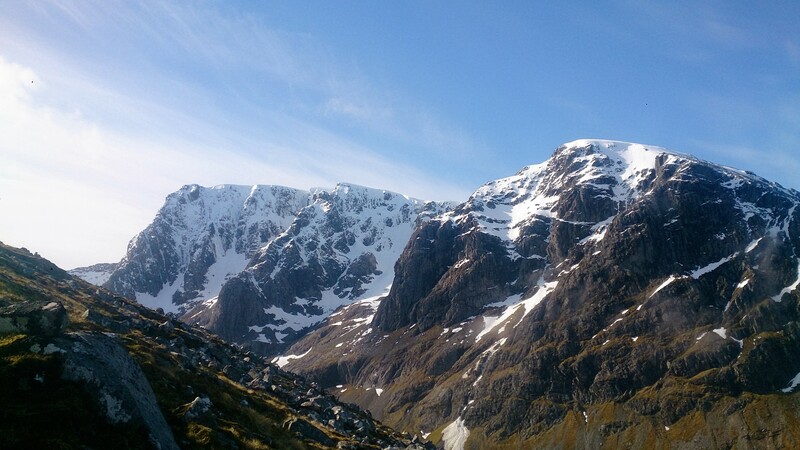 The Munros are a list of summits in excess of 3000 feet, but do not include all such summits. Indeed the compiler of the list, Sir Hugh Munro, did not leave us with guidance on how he came up with his categorisation beyond the minimum height requirement of 3000 feet and the fact that there had to be “sufficient separation” from neighbouring peaks. So he split his list into “mountains” and subsidiary tops. Indeed he stated “the exact number of mountains could not be determined owing to the impossibility of deciding which were the most distinctive peaks”. The Corbetts are a list of summits of at least 2500 feet in height but less than 3000 feet in height. However, the compiler, John Rooke Corbett, required his summits also to have a drop all round of at least 500 feet. This is a prominence criterion to which I return. The Donalds are defined as elevations in the Scottish Lowlands of at least 2000ft in height with a drop of at least 50ft between each elevation and any higher elevation. Furthermore, elevations separated from higher elevations by a drop of less than 100ft are required to have “sufficient topographical merit”. The compiler of this list, Percy Donald, did not define what he meant by that phrase. So there we have three different ways of categorising mountains or hills. Only one, the Corbetts, uses wholly objective criteria. The others are a combination of absolute height, subjective assessment and (in part) drop. I return to the question “what is a separate mountain”? The answer must combine absolute height and some distinguishing feature of the summit one is considering. In the UK we tend to think of any summit in excess of 2000 feet or 610 metres as being a mountain. Of course, that elevation would count for nothing in the Alps or the Himalayas. But the elevation gain from Wasdale to the summit of Scafell Pike is 2½ times that of the Eiger by its easiest route. Is the Eiger therefore not a mountain? Elevation must be seen in the context of the surrounding land form. Absolute height cannot be the sole determining factor as can be seen from the Everest South Summit example. If subjective criteria are not to determine the categorisation, then there is really only one objective measure that really works. This is the concept of “prominence”. It is arguable also that “isolation” is relevant. In other words how far a particular summit is away from its nearest higher neighbour. But that cannot be the sole determinant, otherwise a remote island atoll would meet the necessary criterion for a mountain. Think of an island in the Maldives for example. Prominence is a term that represents the elevation of a summit relative to the surrounding terrain. It is defined as the elevation of a summit relative to the highest point to which one must descend before re-ascending to a higher summit. 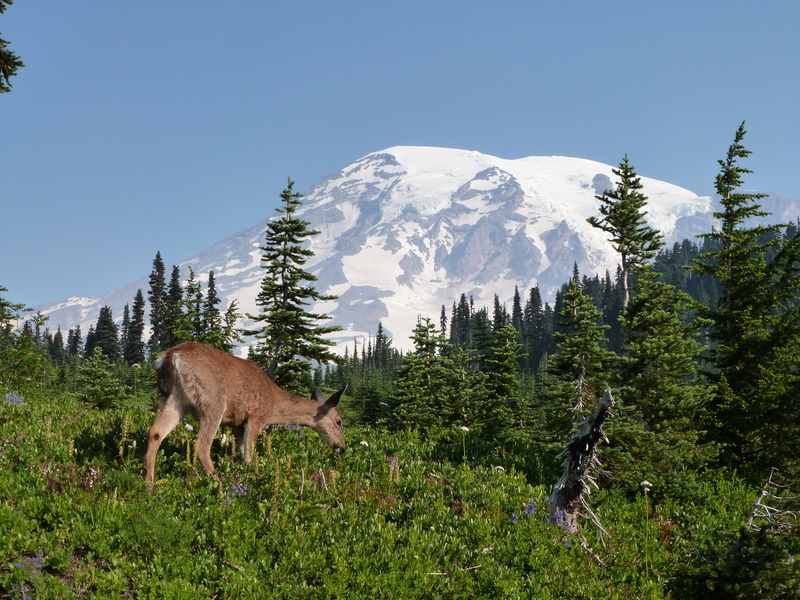 In other words, prominence is calculated as the difference in elevation between a summit and the highest saddle that connects that summit to any higher terrain. Put yet another way, prominence is the elevation difference between the summit and the lowest contour that encircles it and no higher summit. 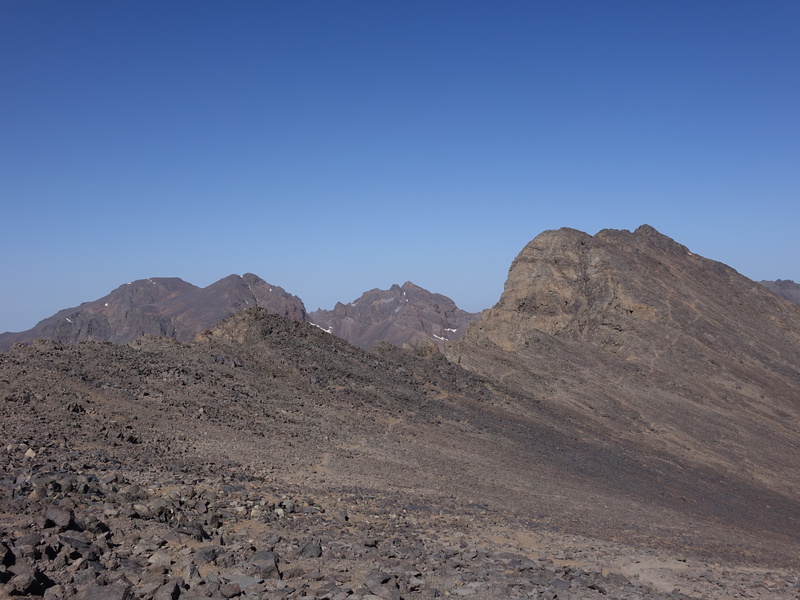 It is the minimum height by which one would have to descend from a summit along a ridge in order to re-ascend to a higher peak. The concept of prominence has gained a large degree of acceptance in the world of peak bagging. In the UK Alan Dawson published in 1992 “The Relative Hills of Britain: Mountains, Munros and Marilyns”. 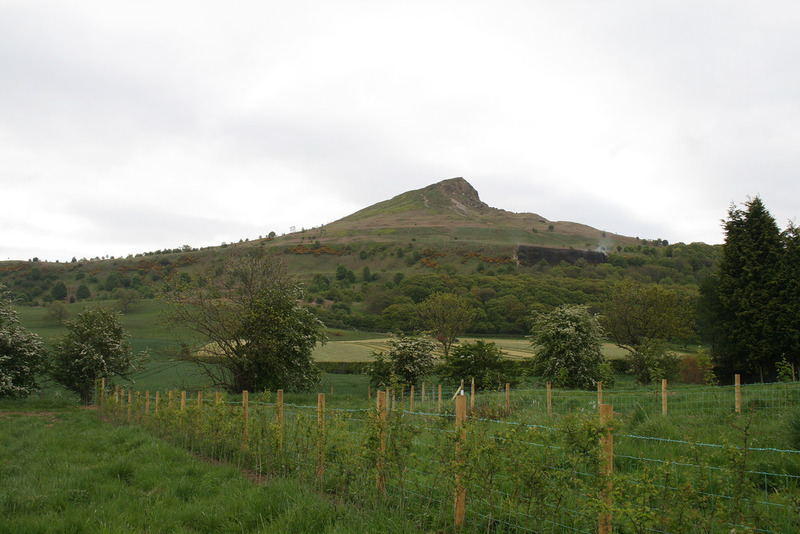 Here he listed what in Britain were hills that were relatively high by reference to their surrounding terrain. There was no absolute height requirement. All he did was to adopt a prominence criterion of 150 metres (roughly 500 feet). He called these hills Marilyns as a play on words with Munros. There are 1557 of them in the British Isles (excluding the Republic of Ireland). You can read about my journey around the English Marilyns here. Of course that begs the question as to what the prominence value should be if prominence is to be the objective measure to be used to determine whether or not a particular summit is to be regarded as a separate mountain or hill. In UK terms we have a number of listings that use different prominence values – Nuttalls (15 metres of prominence and a minimum height of 610 metres), Hewitts (30 metres and a minimum height of 610 metres), HuMPs (100 metres, no minimum height), TuMPs (30 metres, no minimum height) – in addition to the Marilyns. A significant piece of work on the concepts of prominence and isolation by Andrew Kirmse and Jonathan de Ferranti is available here. The paper mentions others whose contributions to research in this area should be noted. That brings me to the purpose of this blog. Without determining what I might consider to be the appropriate measure to define what constitutes a mountain (because it is unlikely that there would be agreement on this), I come to the concept of Ultras. As mentioned above, Ultras are the ultra-prominent peaks of the world. These are summits that have a prominence of at least 1500 metres (approximately 5000 feet). In other words, topographically, they are significant summits. 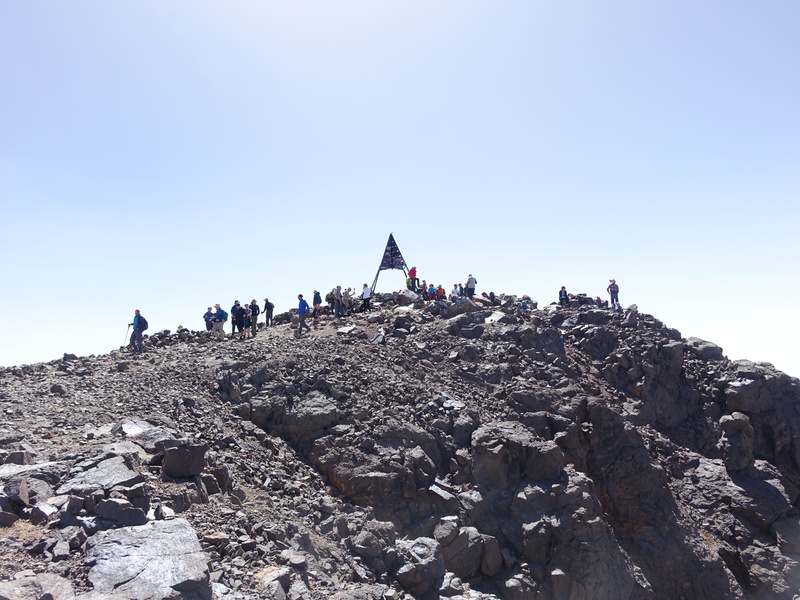 Coincidentally there are around 1500 such summits (a few more in fact). The table below compares the ten highest mountains in the world (which are all in the Himalayas or Karakorum) with the ten most prominent mountains in the world (which have a much wider geographical spread). Only Everest is in both lists. K2, the second highest mountain in the world, is a lowly 22 in the prominence listings. High points of continents and of islands and volcanos feature highly in this top 10. There are no Ultras in the British Isles. A whole host of information on the topic of prominence can be found at the peaklist.org website. I gratefully acknowledge the assistance of the information there in producing this blog. Since the Kirmse/de Ferranti paper referenced above, further detailed analysis and the availability of satellite information has enabled the Ultras list to be updated. Peak bagging in the UK is a well-known pastime now whether it is the Munros, the Wainwrights in the Lake District, the Marilyns or one of the many other lists. But does peak bagging extend to bagging Ultras? Well the answer to this question seems to be yes. Some mega baggers have climbed in excess of 200 Ultras, though there is no complete list of people who have climbed numerous Ultras. Matthew Holt (South Africa) with 36. Jaime Viñals (Guatemala) with 33. Gerry Roach (USA) with 30. MJ Kim (South Korea) with 30. Petter Bjørstad (Norway) with 30. Geri Winkler (Austria) with 30. Junko Tabei (Japan) with 28. Bob Packard (USA) with 27. Father Morgan Batt (Australia) with 26. Gerhard Schmatz (Germany) with 25. Rob Woodall (UK) with 24. Ken Jones (USA) with 24. In the list there is just one woman, Junko Tabei (the first woman to climb Everest). There is a Roman Catholic priest and a South Korean with the rest being European or North American but with a South African leading the pack. 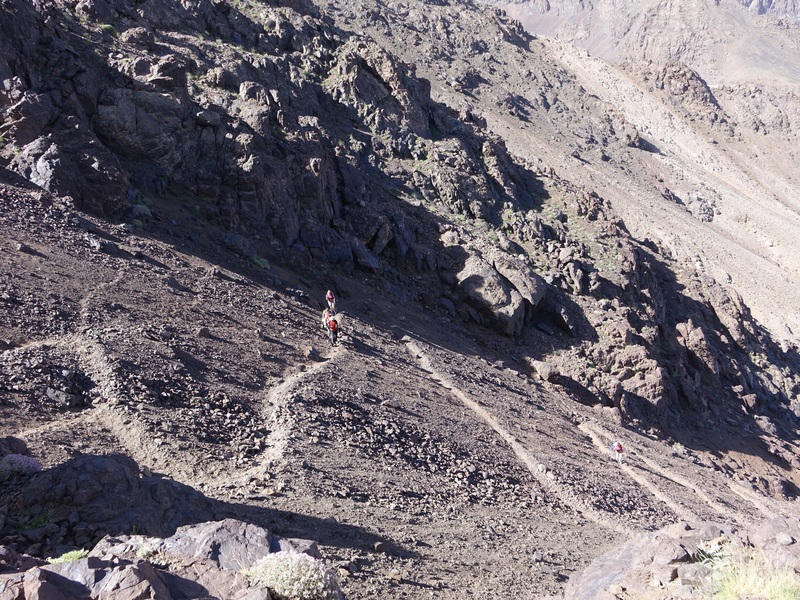 Research on and collation of the lists of those who have climbed significant numbers of Ultras (and other prominence categories) has over recent years largely been undertaken by Andy Martin of Tucson, Arizona with the help of climbers from around the world and other written sources. Much of the information for the lists comes from a few websites, though it is difficult to obtain information about Asian climbers because of the language and script barriers. So it is likely that certain individuals may have been missed from the lists. Andy maintains his lists for inspection at his oldadit website. He is always happy to receive updates and corrections. This can be done direct or via me if any reader is aware of any person who merits inclusion on any of them. I have done my fair share of hill walking over the years, especially when I was younger and fitter. But this was mainly in the British hills. However, I was never tempted by, or considered myself fit enough to tackle, the large mountains climbed by my other half. 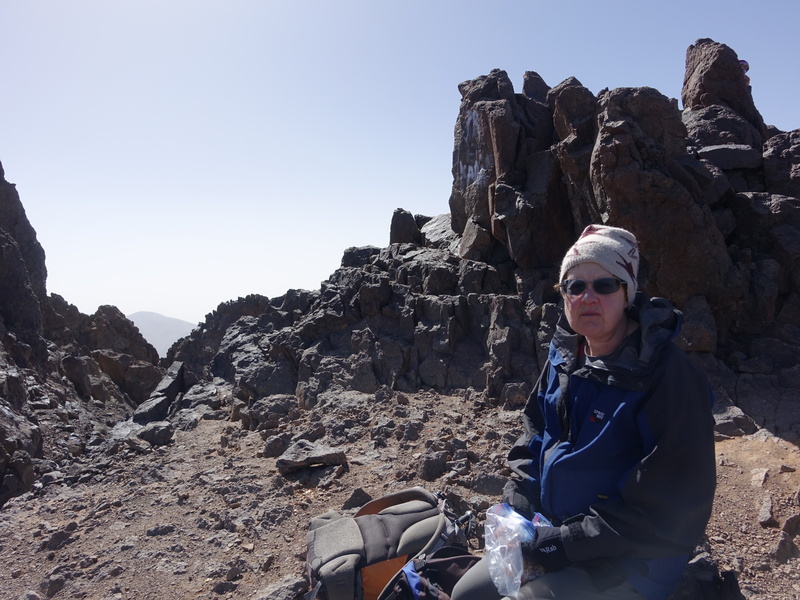 I was also put off by some of the conditions encountered in high places – snow, wind and cold, and the unknown effects of altitude. 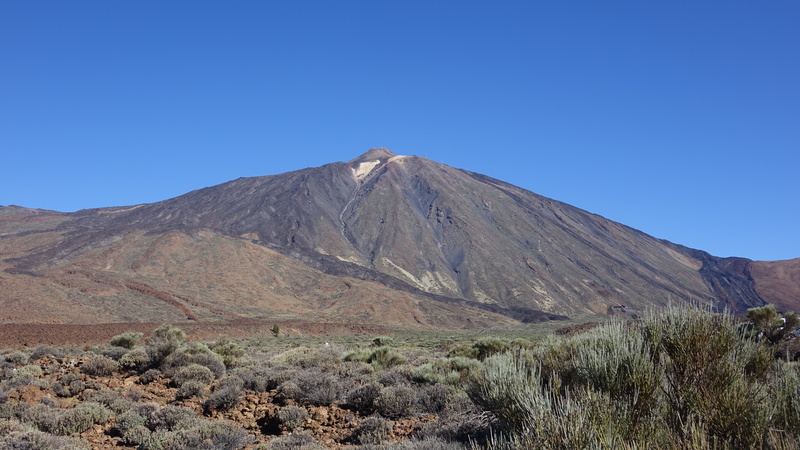 However, after my other half’s amazing achievement climbing the volcanic seven summits, and before being totally past it, I thought I would have a go at a “big mountain”, to test myself and to see what all the fuss is about. The only condition was that I would only go somewhere warm and sunny. 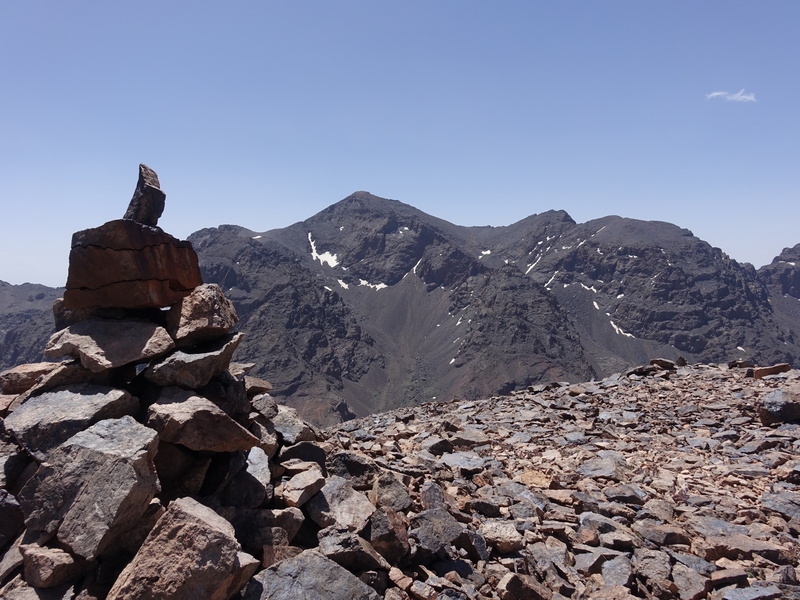 So in June of 2017 a trip to the High Atlas in Morocco was organised, with the intention of ascending Jebel Toubkal, the highest peak at 4167m. 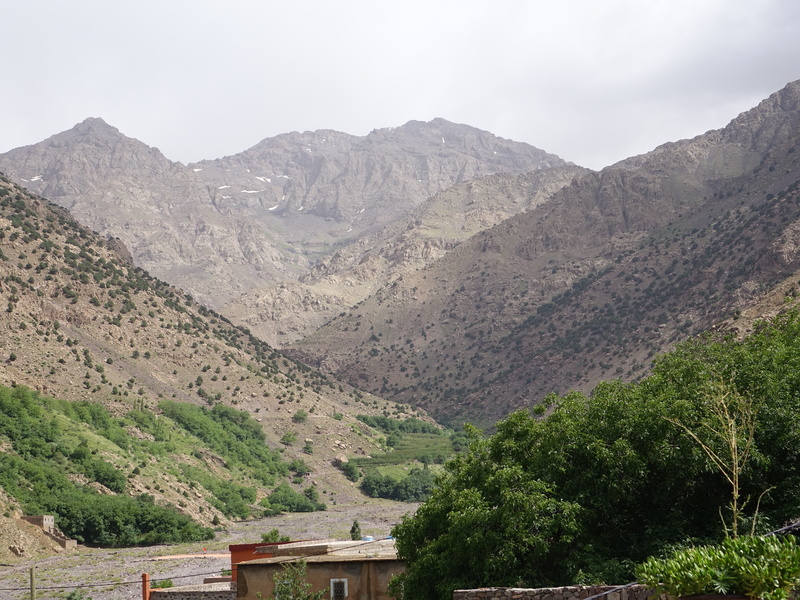 It was a trek over 5 days, so we could see the area and not just the mountain, and to enable us to acclimatise. It was just the two of us plus a guide and a cook, so that we could go at my slow pace. And I would not hold up others in a larger group, or be intimidated by them all being faster than me. My sergeant major of a better half put me through a training regime; more trips to the gym; more days out walking; and going on my regular dog walks carrying the “rucksack of doom” filled with water bottles, building up to 12kg weight. Even so, I was very apprehensive and concerned whether I would be capable of achieving the objective. 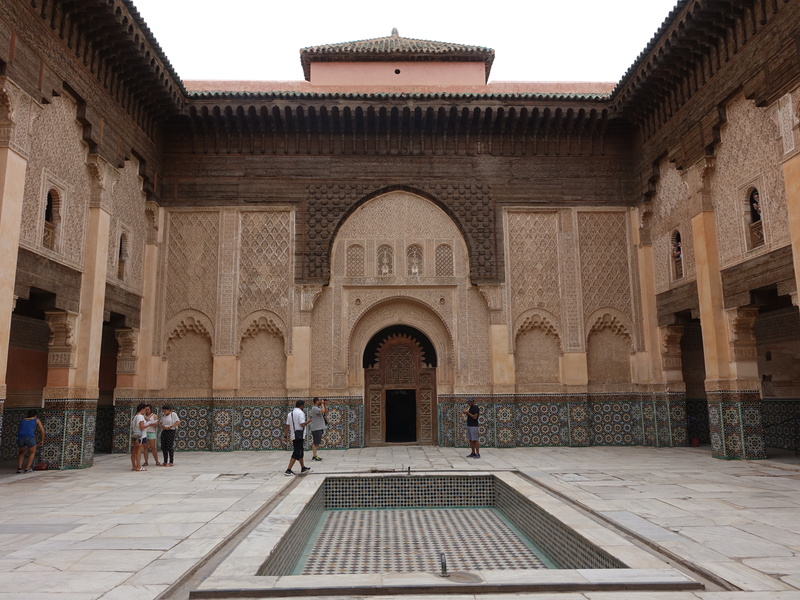 On Saturday 17th June we flew to Marrakech, arriving to a lovely 29 degree heat at the very new, very swish airport. We had plenty of time to admire the airport and the bustling activity outside it, since our supposed pick up was nowhere to be seen. He eventually arrived after a few phone calls and an anxious wait of an hour and 20 minutes, he having first decided to eat his dinner after sunset since we were in Ramadan. Not an auspicious start in terms of the organisation. 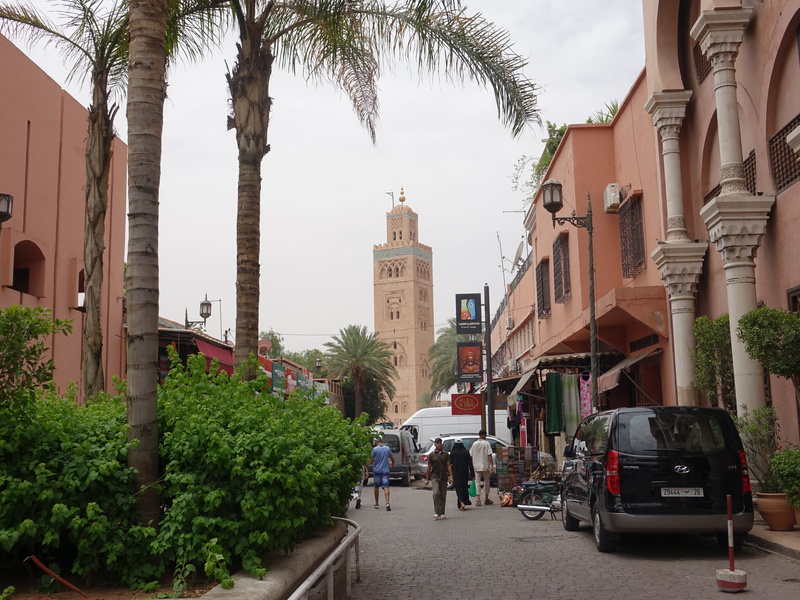 We stayed overnight in a small hotel on the edge of Marrakech’s business district. A different driver collected us at lunchtime the following day after a leisurely breakfast. There was some confusion about where we were going, not helped by the language barrier. We were driven to a different hotel on the edge of the mountains to the one we had been expecting; but we were given tea and made welcome. 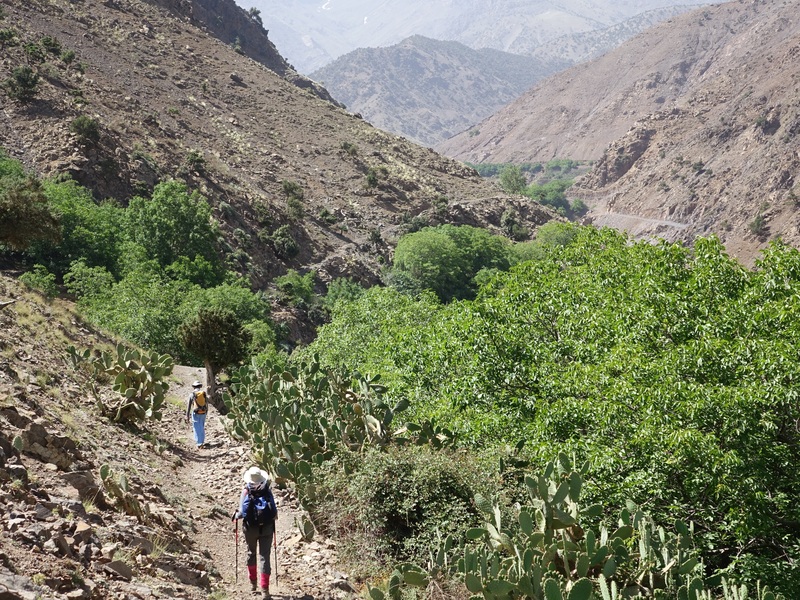 Eventually our guide arrived and explained that we were staying here, an Ecolodge at Ouirgane. 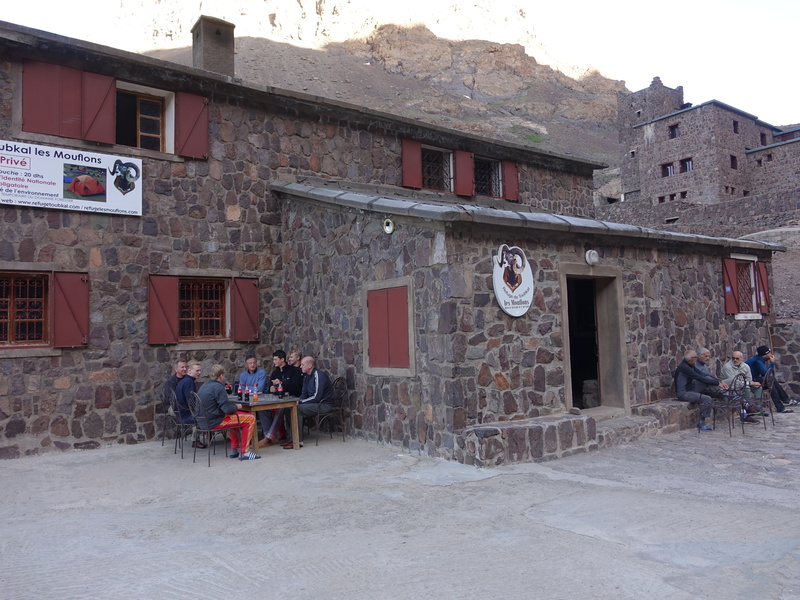 The Lodge was extremely pleasant; the only downside being that tomorrow’s walk would be one to two hours longer (onto an already estimated 4 to 6 hours) because our original itinerary had involved a walk of one to two hours from Ouirgane to our hotel further up the valley. Our guide (Lahacin) took us for a walk around the village; mint grew like grass, but smelled so much better. There was an odd mix of flowers….roses, geraniums, and cacti; and birds from wood pigeons to exotic varieties. 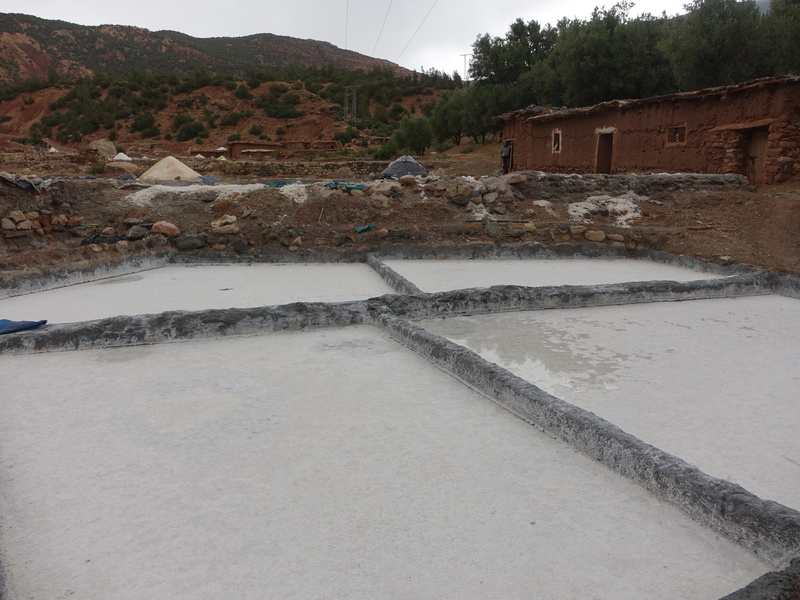 We saw wells where salty water was extracted and placed in beds where it evaporated and left salt as a residue. Mules then transported the salt to markets. 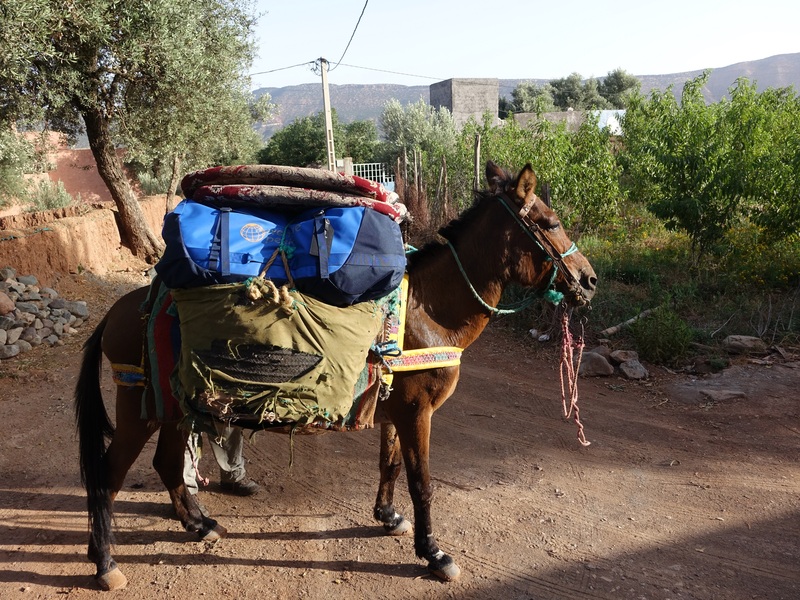 The next morning, after breakfast outside, we met Mohammed and his mule which was loaded with our large kit bag and loads of provisions. Then the walking began. Mainly this was along a rough vehicle track. The first part was an hour and 20 minutes to Das Tassa, the place we thought we were going to stay the previous evening. I was happy that it was within the one to two hour time guide. I was walking pretty slowly, and at times it was tedious as we crossed and recrossed a little river. 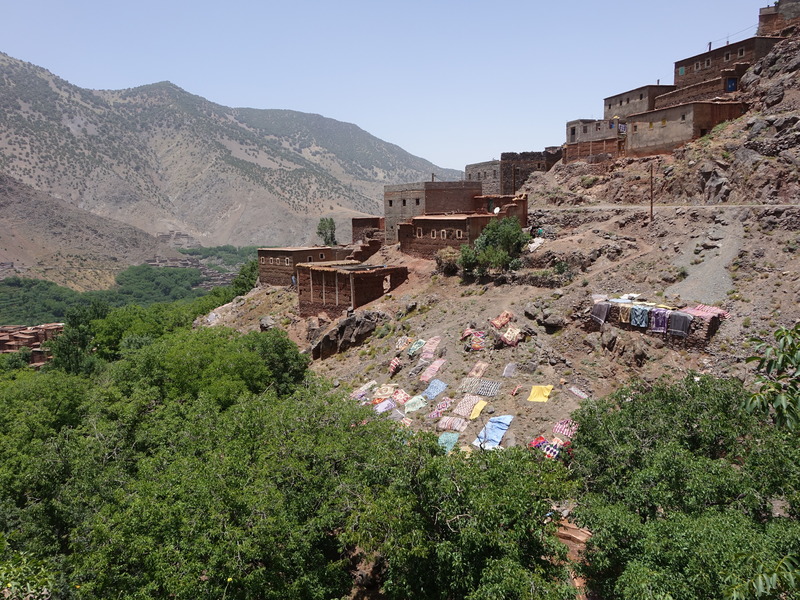 After 5 more hours we reached the village of Tizi Oussem, our next stop. At 1900m this is 900m higher than the Ecolodge. Again it was within the time estimate though frustratingly our accommodation must have been the highest point in the village and the furthest point from the perimeter so the extra 20 minutes walking up to it were an annoyance. 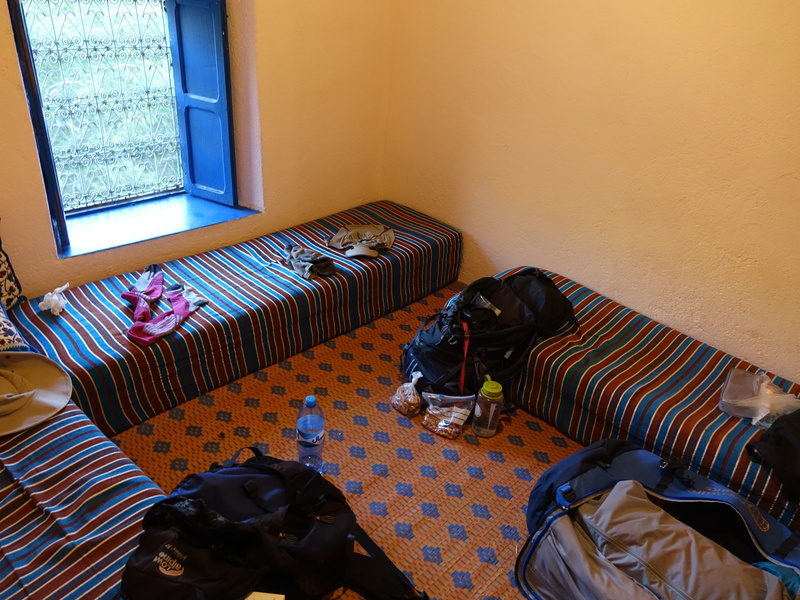 The accommodation was rather like a hostel, but we had a room which would sleep 3 just for the 2 of us. 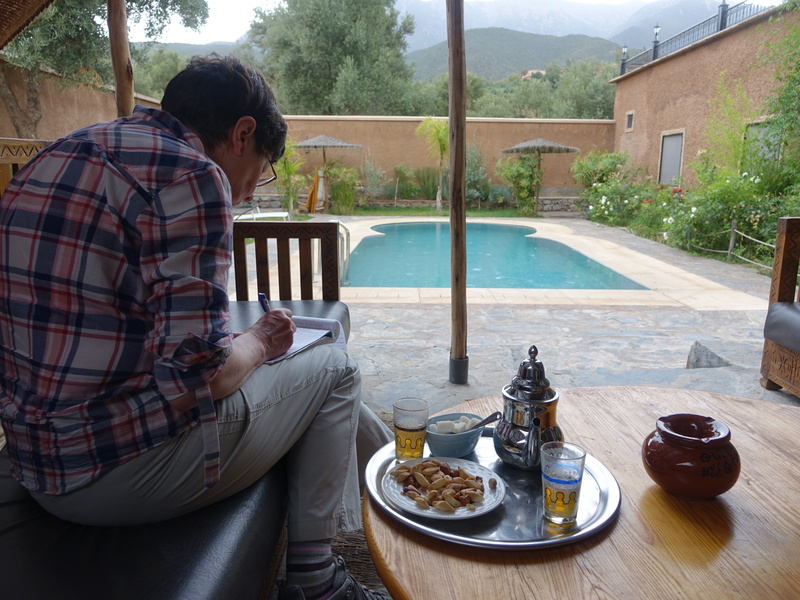 On arrival we were given mint tea and a lovely lunch, comprising salads, pasta and a tagine, all prepared by Mohammed. 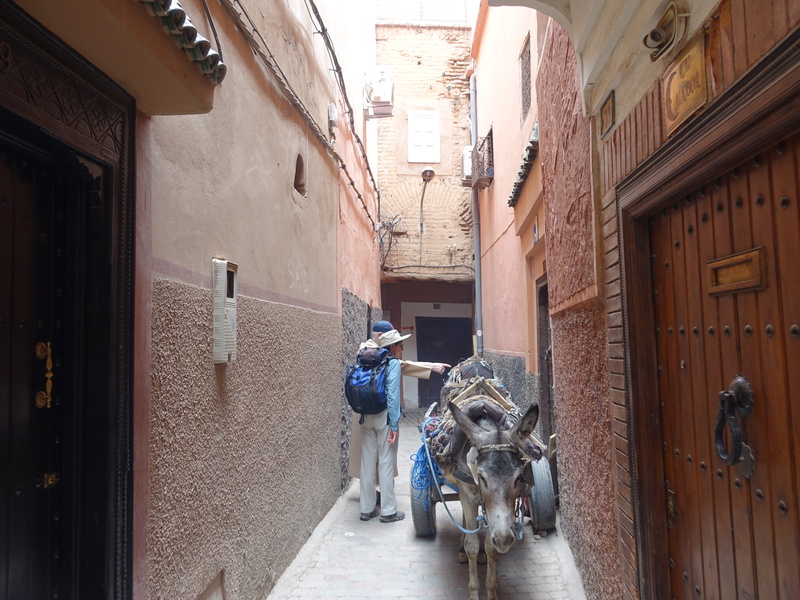 We rested rather than explore the village…..I felt I had seen enough on the 20 minute slog through the narrow alleys. Later we had more tea and the offer of biscuits, which we declined as plain and unappetising. 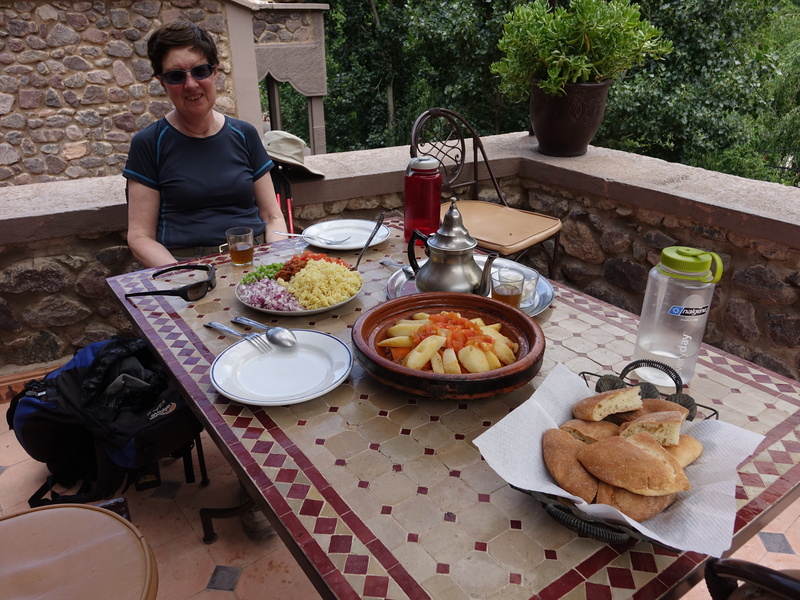 The evening meal was soup and bread, some sort of stew/tagine and then fresh fruit. That was to be the pattern for meals for the trip; excellent food, and piles (too much) of it. 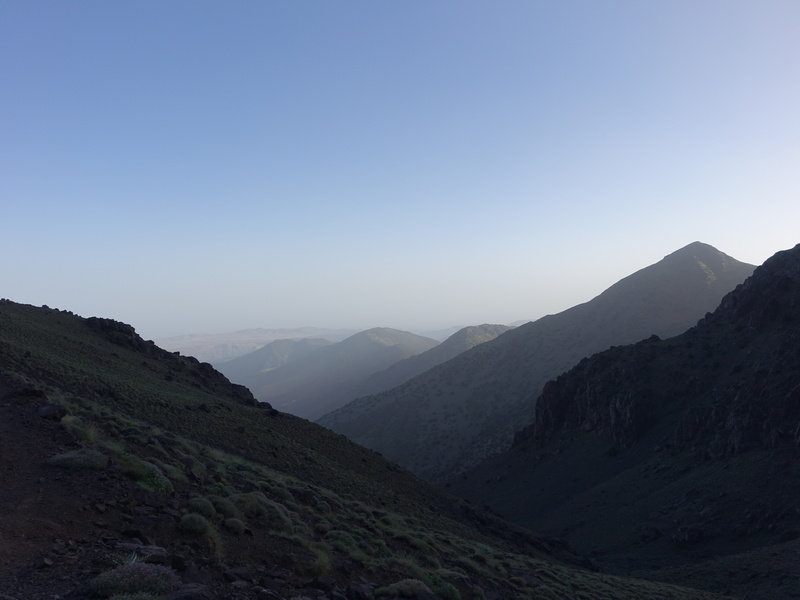 Since it was Ramadan the guide and muleteer were not able to eat or drink between sunrise and sunset. So they ate later, and again in the early hours, but had to undertake each day’s exercise without nourishment or water. Breakfast was at 6am, porridge with jam to add, plenty of bread. 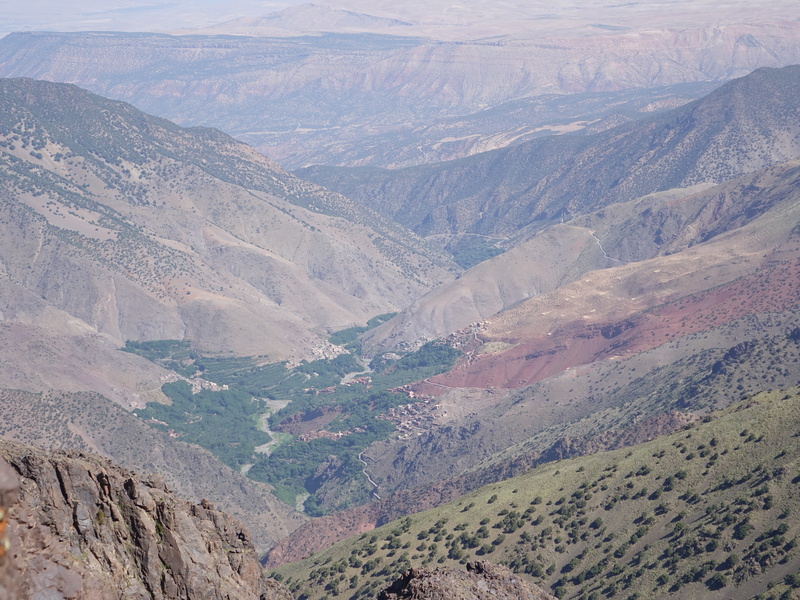 We set off from the village and through juniper forests. I was slow and wanted more rests than we were given. Today I was going to be dragged up to 3000m. We had brief chances to catch breath and were told we would stop at a good place so ploughed on. The guide’s chosen place eventually came, and it was well worth keeping going to that point. 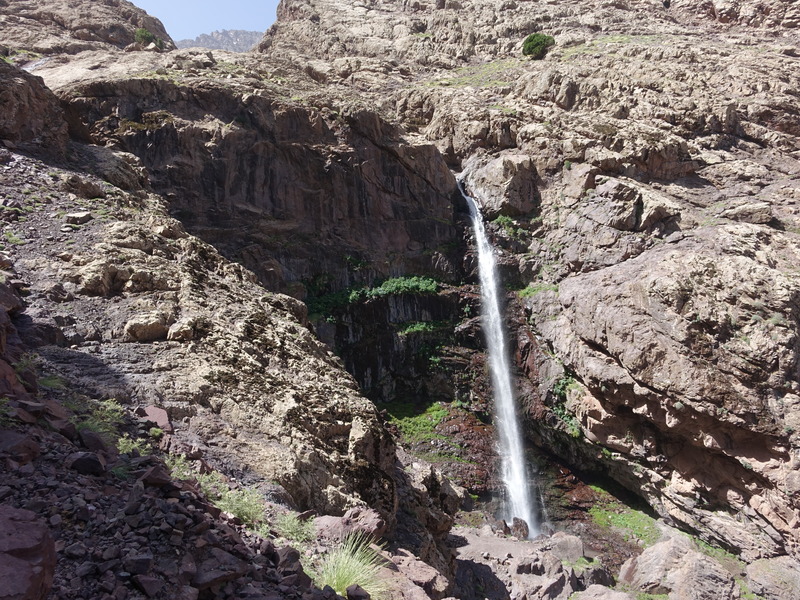 It was by a waterfall, sheltered from the wind, and with good views. Plus there was a youth there with a makeshift kiosk, somewhere to sit, and drinks to buy – coke, Fanta and fresh orange juice. 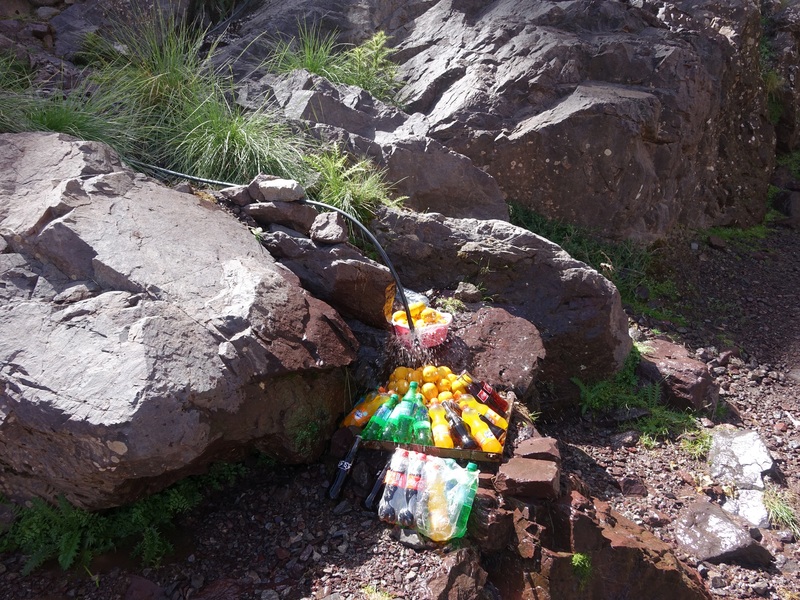 The lad had rigged up a pipe to run water from the stream under the waterfall over the cans of drink and the oranges to keep them cool. He took some of the cooled oranges and squeezed them in a press…it was wonderful and refreshing, and about £1.25 for a generous glass. This was another example of the locals making the best use of the natural resources, the water and the land. 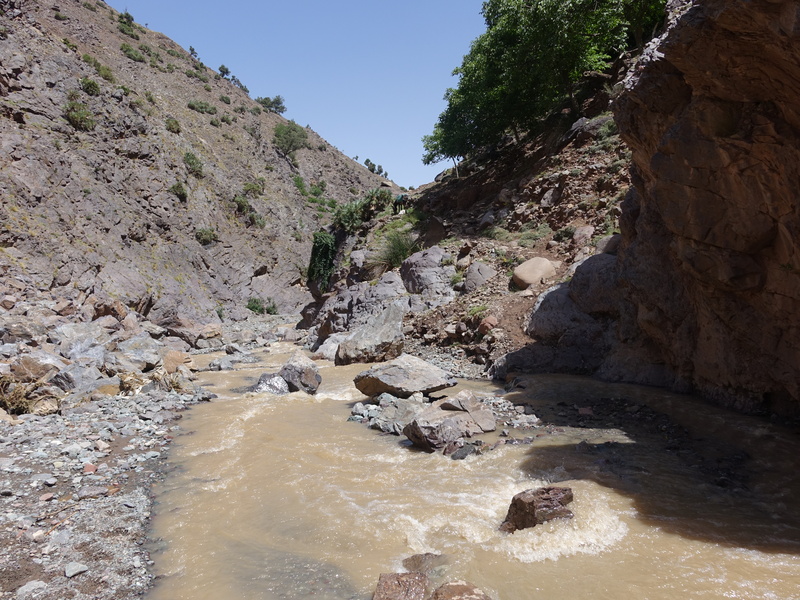 On each day we had seen places where streams/snow melt had been used in irrigation channels, and any available land being cut into terraces to grow crops, maize drying in fields behind windbreaks, women picking vegetables or grazing their goats on the path side. After our welcome rest we headed up, thankfully not up the waterfall but contouring around it. It was however very steep and very hard. It was cooler in the shade and in the increasing wind, so we had to don our cagoules. Emerging from the head of the valley from the waterfall we still had a way to go to our next night’s stop, at the Lepiney Refuge. Although we could see it in the distance it seemed to take an age to reach it. The guide seemed anxious to press ahead, and in fact it would not have been pleasant to stop because the wind was very strong. At times I had to stop to brace myself against the gusts, and felt as if the wind was sucking my breath from me. The Refuge was billed as basic accommodation. There was a porch (where muleteers slept), one basic room with a table, chairs, shelves, a bunk at one end for guides and kitchen area. 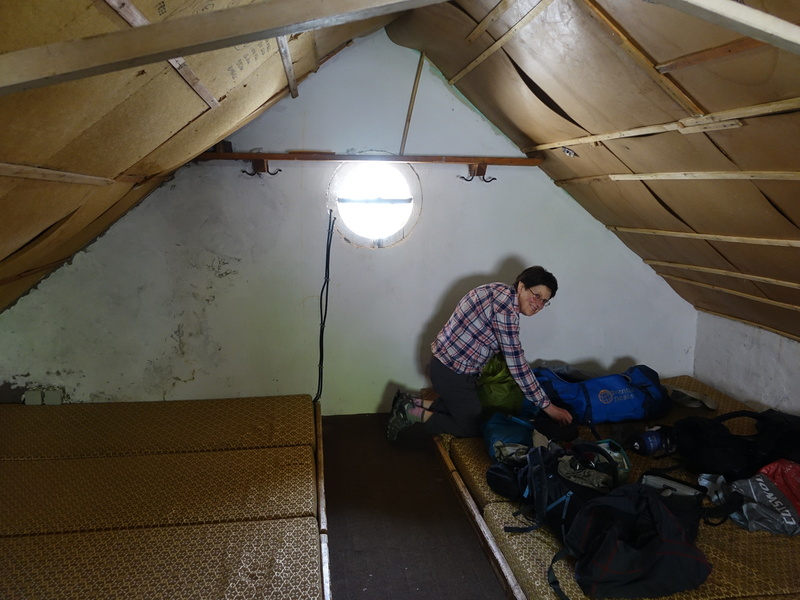 Our accommodation was up a vertical ladder through a small hatch where the upper floor was the extent of the building with mattresses set out. The “facilities” were outside in a shed down some steps, a little way from the main building. As the previous night, the “toilet” was a hole, over which you had to squat, and hope your aim was good; if not there was a tap and a little bucket to use to swill the area. The basic facilities were offset by the excellent food again, and the company of a Canadian couple. We had our afternoon tea with them and they graciously shared the popcorn that they were served with theirs. Ourselves, the Canadians and our respective guides and muleteers were the only occupants of the Refuge that night; so the place actually seemed roomy; we could spread out on the mattresses upstairs; and we all ate together later in the evening after sunset. Unfortunately I had a pretty uncomfortable night. I was disturbed by the wind howling around and started to worry about the next day’s walk in the conditions. 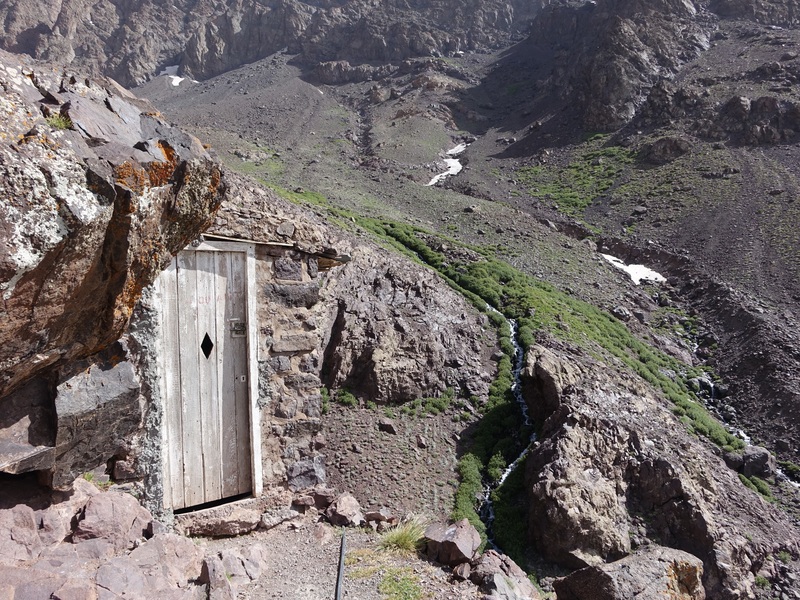 I also needed to go to the toilet but tried to put it off, fearing disturbing the others in the room, falling out of the trap door or down the ladder, disturbing the guides downstairs, getting lost negotiating the route to the toilet, getting blown away! Eventually I had to obey the call of nature, and I managed to find my way there and back without adverse incident. We set off at 5:30 the next morning. It was already light but thankfully not as windy as I had feared. We had to retrace our final steps from yesterday which meant losing 150m of height. Then we took a new route and started the uphill plod. We were not yet at the infamous zig-zags but the path began to veer from side to side. Eventually we reached a col where there was a group camping. We had a rest stop here……and the Canadians who had set off from the Refuge an hour after us passed us and seemed to be sprinting! The next section was a series of zig zags which we had been expecting. Opinions in the literature varied as to whether there are 99 or 137 of these! I’m convinced there were at least 250. 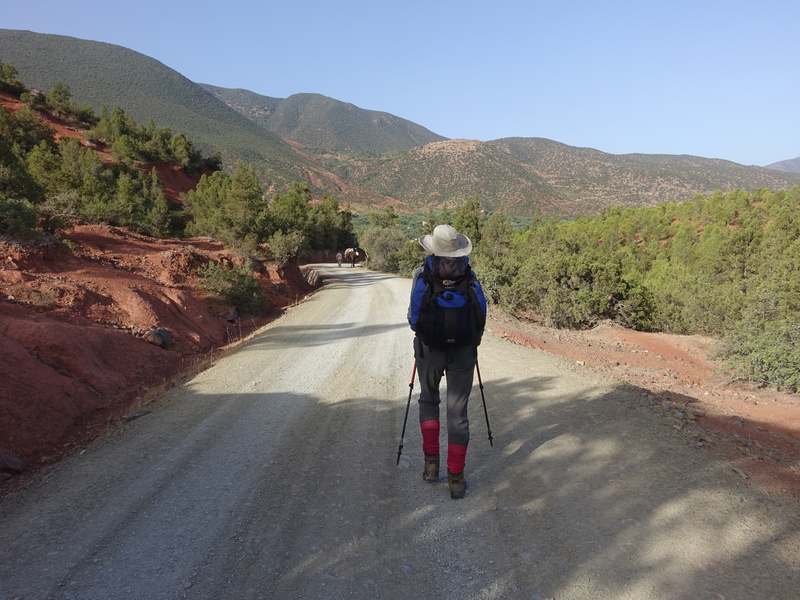 I just kept wanting to stop and catch my breath; I used other trekkers wanting to overtake us, and donkeys needing to pass, as any excuse to stop. The only word to describe the zig-zags was interminable. The guide suggested I should lengthen my poles, and use them in a better way. Other half suggested he should teach me to walk properly……….so for the last 60 years I have been doing it wrong!! He was concerned about my technique, and I needed to place weight on my heels, and pay more attention to my foot placement, for example on rocks, so that I would not slip back. They were both trying to be helpful, but neither endeared themselves to me at that point! We were mainly walking in the shadow of the mountain face, so it was not too hot. It took about an hour and a half to reach the first ridge, but at least another half hour to the end of the zig zags. 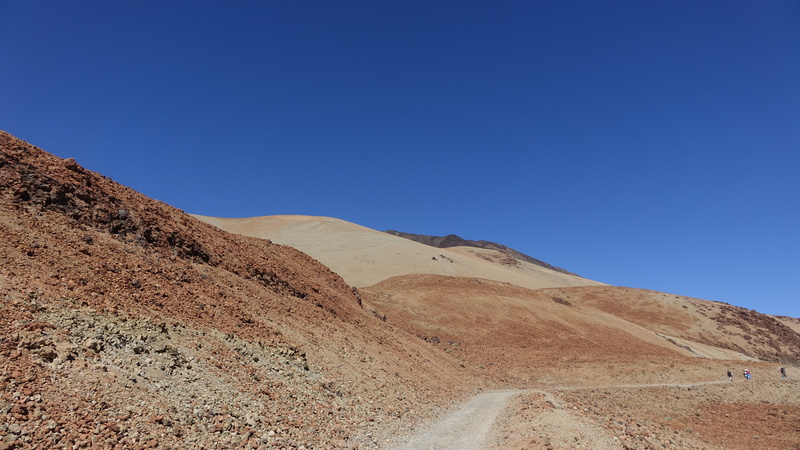 And then of course that wasn’t quite the end because there was a further climb to the col at 3400m. Finally we reached the col, bought a drink and had a half hour rest. My hands were very cold. I had a pins and needles tingling sensation. I couldn’t really feel them so I spent the time shaking them and trying to warm up. I hoped it wasn’t a sign of any other problem; it had occurred to me a few times that in the event of illness you were pretty exposed and getting help would be a big issue. 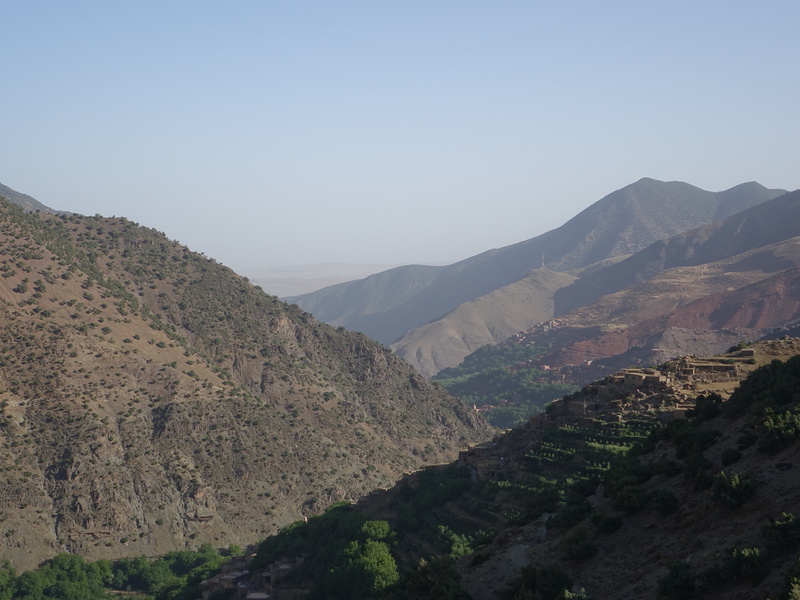 At least the view across the valley to Toubkal was rather nice. 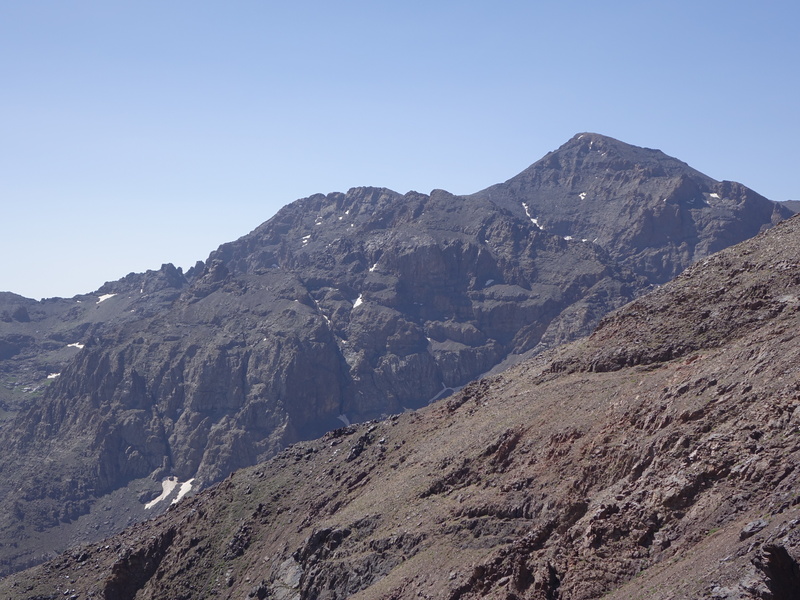 At this point the other half decided to take a detour to ascend a higher point from the col and then make his own way down to the track towards the Mouflon hut which was our final objective of the day. The guide and I went directly down from the col; it was very steep and tricky to descend, and inevitably we made very slow progress. When we could see the buildings in the distance it didn’t really help because they seemed to move further away as we approached rather than get closer! 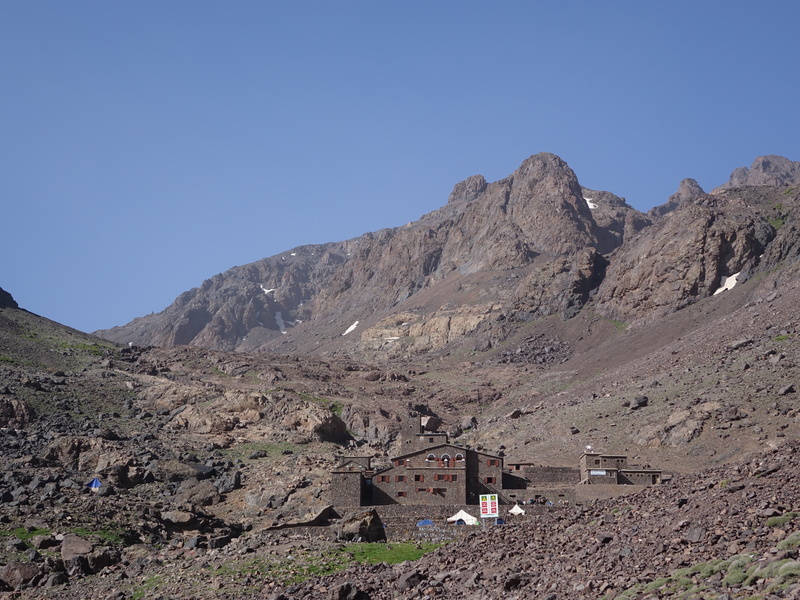 I was extremely tired when we arrived at the Mouflon Refuge at 1:20pm, almost an 8 hour day and 7 of those very hard walking. 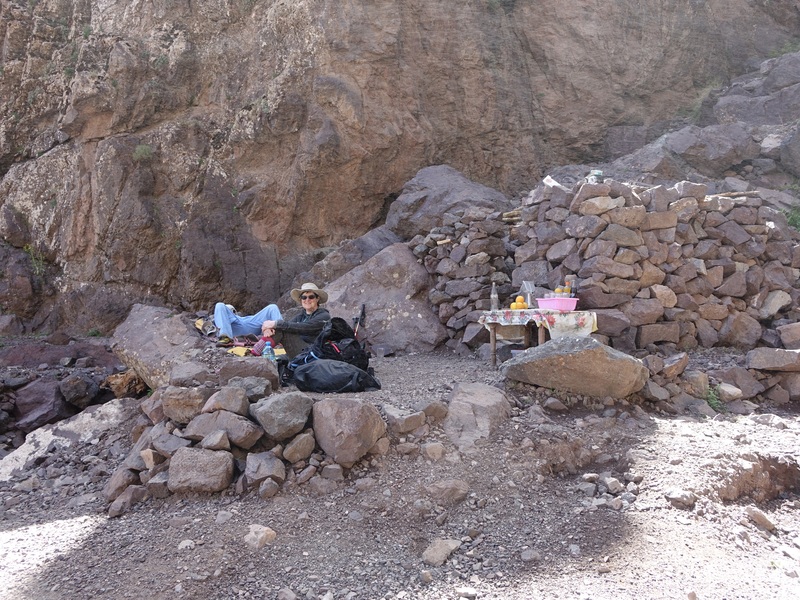 I flopped in the dining area and had mint tea, and we had lunch when the other half arrived about 20 minutes later having ascended Aguelzim at 3710m. The Refuge is a large building with dormitories, bathrooms (western style toilets – yay! 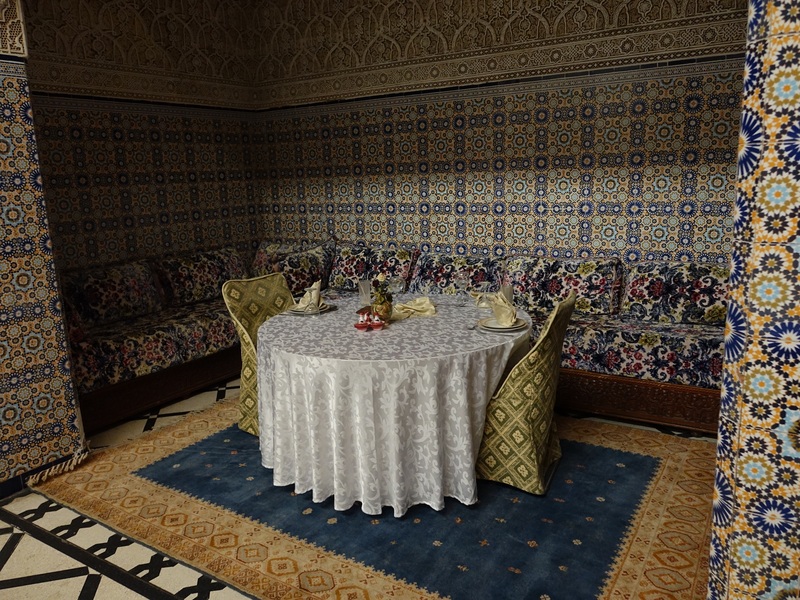 ), communal rooms to relax and have meals. We were in a dorm with the Canadian couple, and some others, but thankfully it wasn’t full (room for 24). We were so tired we had a nap but that probably wasn’t the best idea. I woke with a headache which a migraine tablet did not alleviate. We had more tea with the Canadians, an English lady and others. But then I began to feel nauseous and was slightly sick. We consulted the guide and I was advised to drink, slowly and take it easy. I surprised myself by being able to eat dinner without feeling any more sickness and gradually the headache eased. On the advice of our guide I waited an hour after dinner before getting ready for bed, drinking a bit every 5 minutes. He was worried that I may develop sickness again, or dizziness, a worsening headache or any problems with my eyes. We were instructed that should any of those symptoms occur we should tell the guide and if necessary I could be taken down to the village. I was anxious about any of that occurring, but I did not want to be thwarted in my attempt to reach the summit before I had even tried. Also I was particularly concerned that the other half should not lose out on the summit attempt. In the event I had no further symptoms. I am still unsure whether the episode was a result of altitude problems or merely a bad migraine after an exhausting day following little sleep; or some combination of the two. And so summit day dawned….well it would eventually. We were up well before dawn and struggling to eat porridge for breakfast at 4 am. We set off about 5:20am. This was well after most of the other occupants of the hut. The forecast wind fortunately had not materialised. I thought that pacing yourself was important; and indeed the other half had said this, and recounted his previous expeditions where the motto was “pole pole” meaning “slowly slowly”. So I was doing precisely that…..only to be told “Come on, you can go faster than that”. Well no, actually, I really felt that I couldn’t because I felt out of breath! 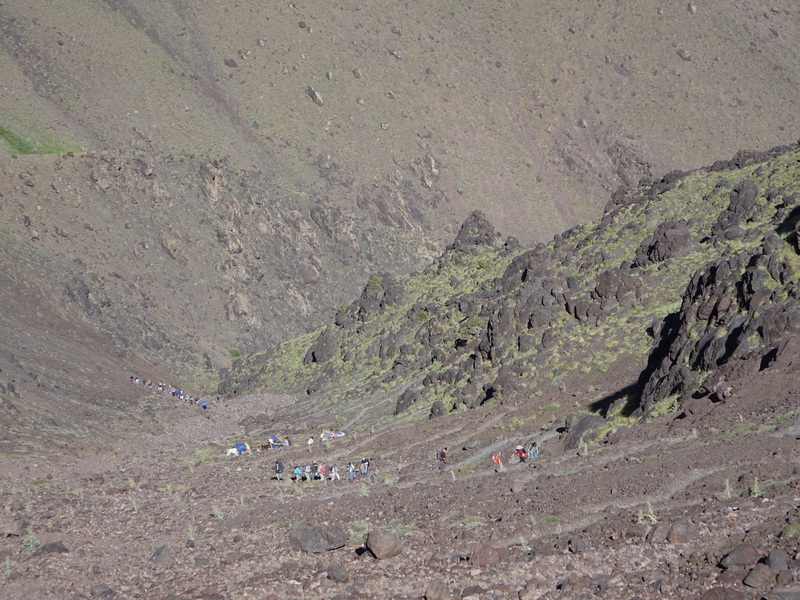 The path led off steeply uphill behind the Refuge and then to a section of boulders which involved some scrambling. This wasn’t too bad because you felt as if you were making upward progress. We did have a number of stops; one after a snow patch; one after being overtaken by a group of singing Italians(! ); and after a tricky section where I was attached to the guide with his scarf so that I could follow in his footsteps. The other half was clearly frustrated by the slow pace, but kept with us at this stage. I knew there was about 1000m of ascent to the summit, so like climbing a large Munro, but starting from a somewhat higher altitude. 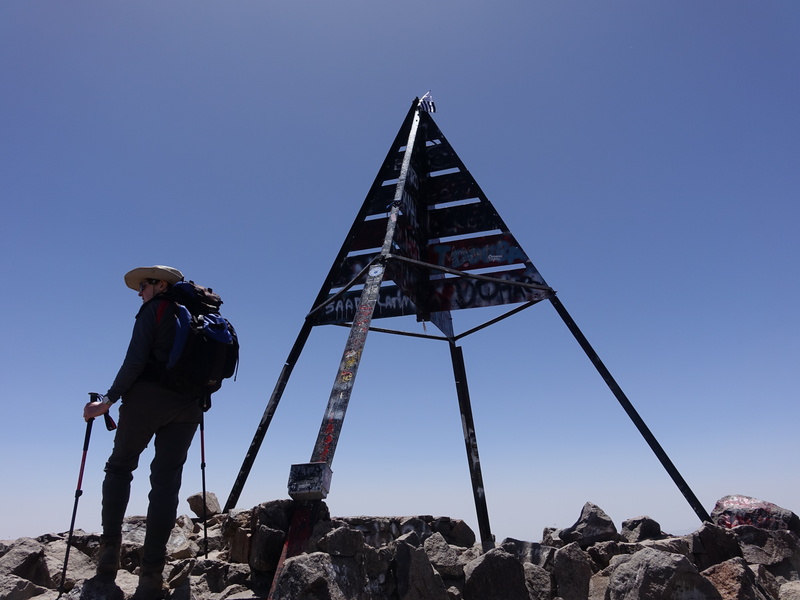 The average time from the hut to the summit may be 3 to 3.5 hours but I knew there was no way I could do that and was expecting it to take 5 hours. I just kept thinking about seeing our son, coming home from Sheffield University when we got back; and a few days later me going to Cyprus to visit our daughter who was working there. 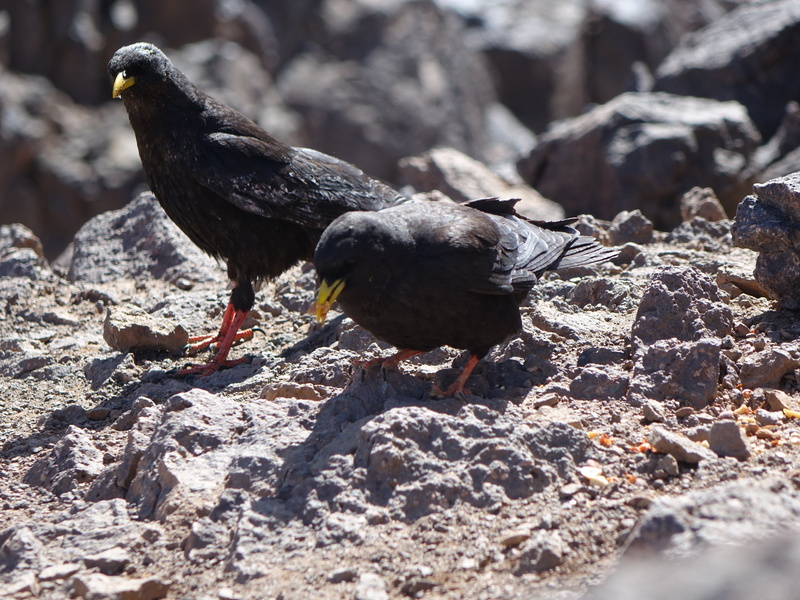 So I was inwardly counting and reciting to myself, 1000m feet of scree and rock and then I can see my children. Strictly speaking it was of course 1000m up, and the same down but I figured I could cope with that. We finally reached the col after a long scree slope, which we had been able to see for a while, so that was a sense of achievement. 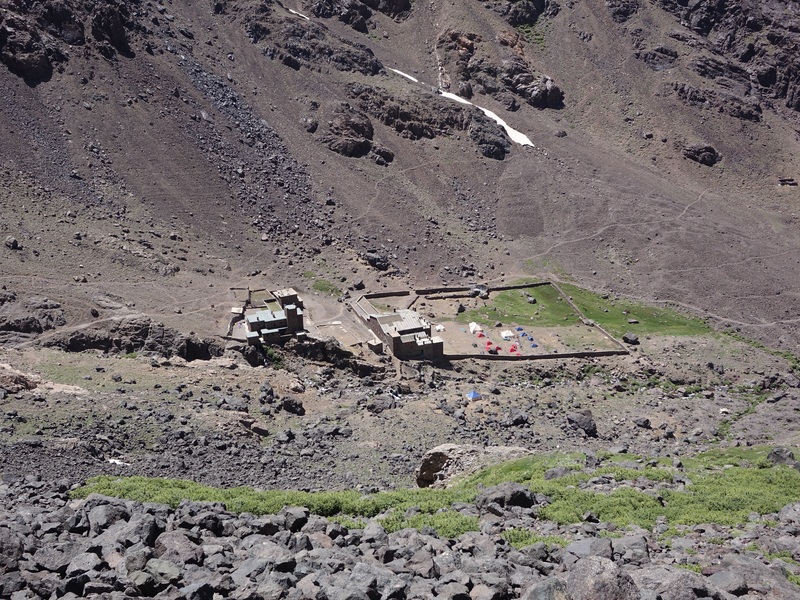 The col lies between the summit and Toubkal’s lower west peak and is at around 3900m. 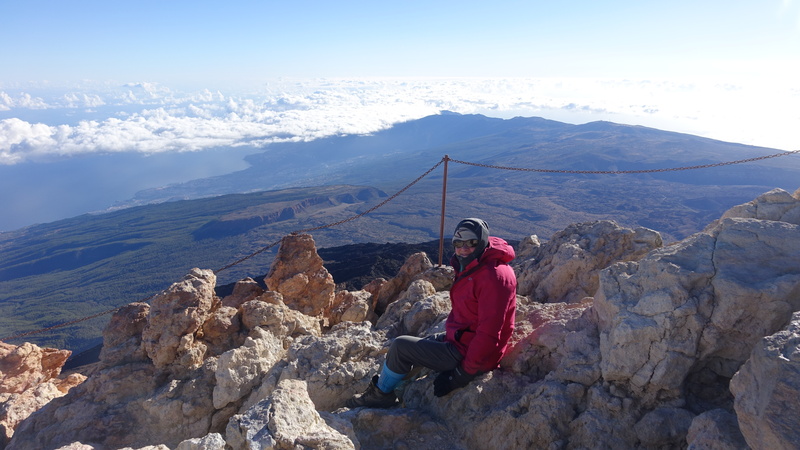 We had a longer rest there with drink and snacks, though I wasn’t allowed to look at the view of the summit…. I had to wait to do that as I approached it. There was an English guy and his guide here, everyone else way ahead of us. At this point I thought I could make it to the summit. The other half reckoned it would be another hour for me from this point, and I was happy to be given a measurable time, and a realistic estimate. The guide and I set off ahead of the other half. He was taking pictures and taking in the views. 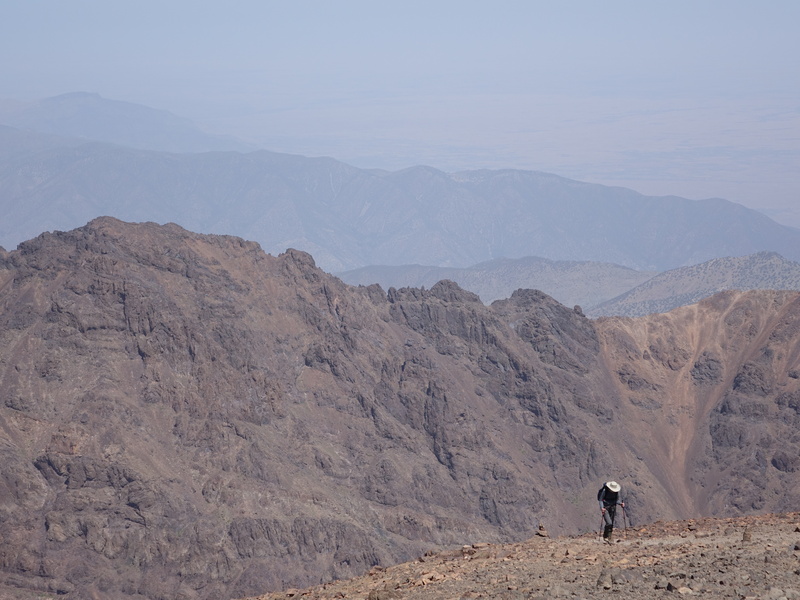 Once he set off he overtook us, and reached the summit [spoiler alert] 20 minutes before us. For the final push the guide again tied me to him with a long scarf. This definitely helped with the pacing. I had to keep going; but it meant the guide seemed to be able to tell (presumably by my breathing, or lack of it!) when I was doing OK, when I needed to stop and catch breath, and when I was ready to set off again. So I was doing it at my pace, but getting there slowly, and not feeling that I was holding anyone up. After 30/35 minutes we reached a bump, which we had previously watched the English guy get to. I was disappointed at the time since the bump didn’t seem half way to the top. However, after this the path contoured around a couple of bumps rather than over them. Ahead of us the other half had stopped …..so he must be at the summit! The guide undid his scarf so I was on my own for the last section; I was still very slow, and short of breath……and the other half has embarrassing video footage to prove it! However, after 5 and a quarter hours I had made it to the summit. I was elated but quite overcome and emotional. 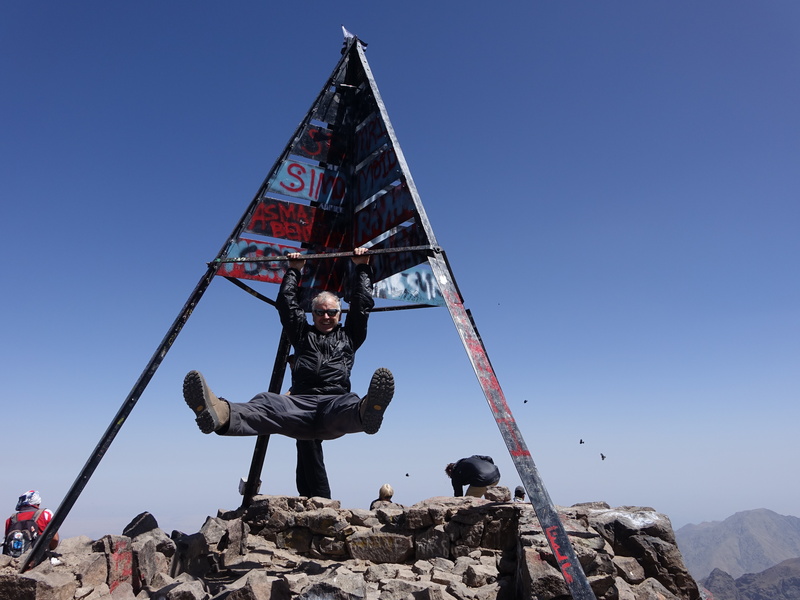 My biggest mountaineering feat; the highest point on earth I have been to, at least under my own steam. I was thrilled by my achievement, and the other half was thrilled for me. 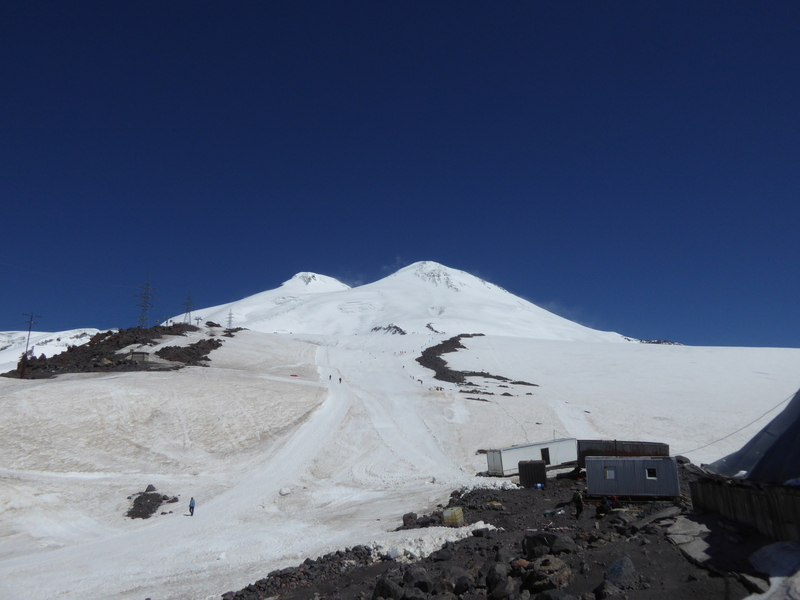 I couldn’t quite believe I had made it…..and only 55 minutes from the col! It was an amazing feeling to be there, and to know that I had achieved it. It was a little hazy but the views were still incredible. There wasn’t a breeze and the conditions were near perfect. The summit was very busy when we first arrived, but soon people were leaving and it was just myself, other half and the guide. Shortly before we left two more people arrived. 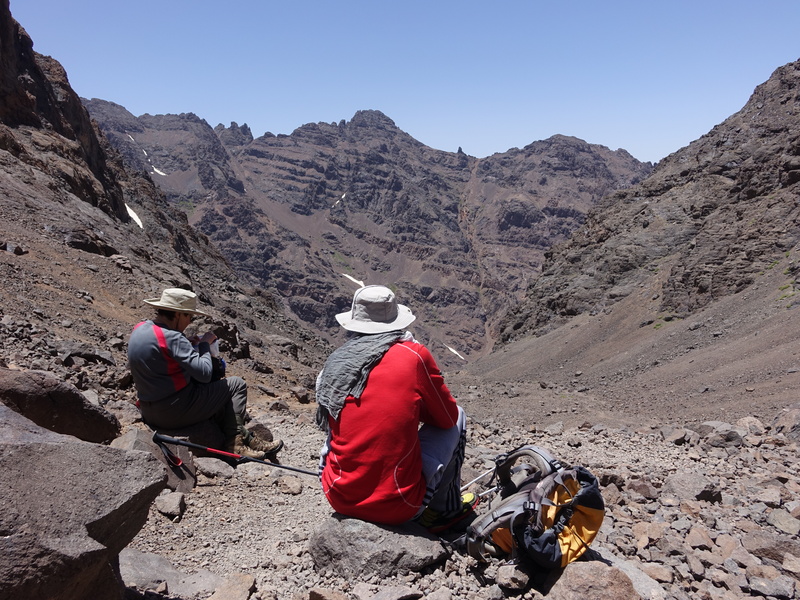 The guide was thankfully happy to stop and rest and let us enjoy the time, sunbathe and savour the views. We spent about an hour on the top, and for about 40 minutes of that it was only the 3 of us…… there are some advantages to having a slow wife and taking such a long time to make the ascent! 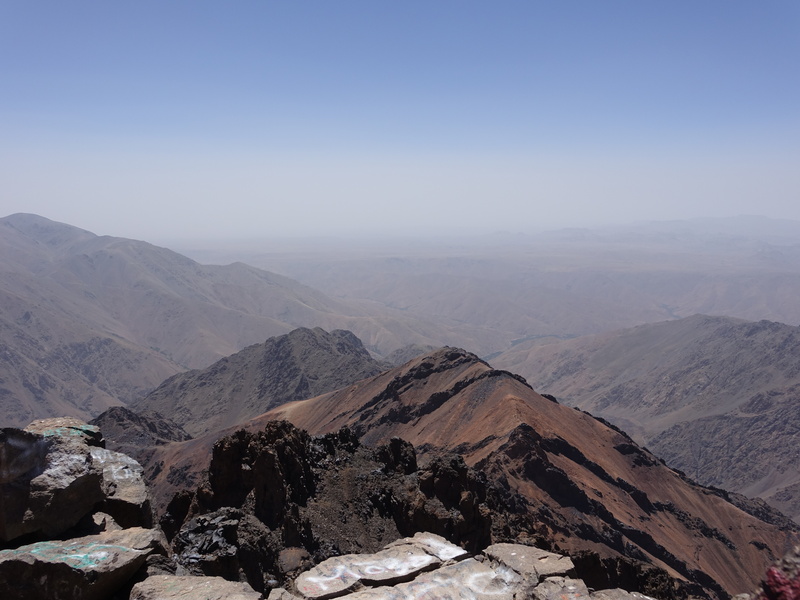 We could make out the distant orange of the Sahara as well as the nearby mountains of the Atlas range. Eventually at about 11:30am we started back down. The guide was again helpful and considerate of my abilities. On some trickier sections my guide advised me to have my hand on his shoulder so that I could follow in his footsteps and make it easier for me; but he was setting quite a fast pace. Even so I managed to slip on a snow patch and slide between the guide’s legs! At that point I suggested, and was granted, a rest! We had assumed a stop at the lip before the final descent; but we pressed on. Eventually we had another stop, only about half an hour before the refuge, but any break was welcome. Just behind the refuge buildings there was a stream and pool area where the English guy we had encountered at the col was dipping his feet. It was a very tempting idea to join him but we carried on and finished at 3pm, the descent taking 3 and a half hours which we were very pleased with. We replenished with tea, salad and fruit, excellent as always. We were just thinking that Mohammed had finally realised he normally gave us too much food and had moderated the amount given to us when the inevitable tagine appeared. We expected to nibble at it and be apologetic about not being able to eat more. But delicious spicy chick peas were revealed and I wolfed down half of them! We just festered for the rest of the afternoon, hardly moving from the same spot apart from a while outside to take in the views before sunset. The following morning we had a fairly early start, not a stupidly early start. 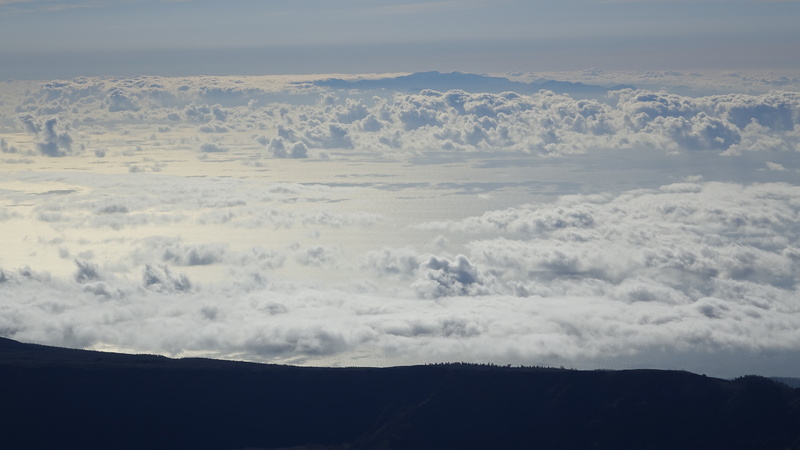 It was more cloudy than of late over the summits, but very warm. 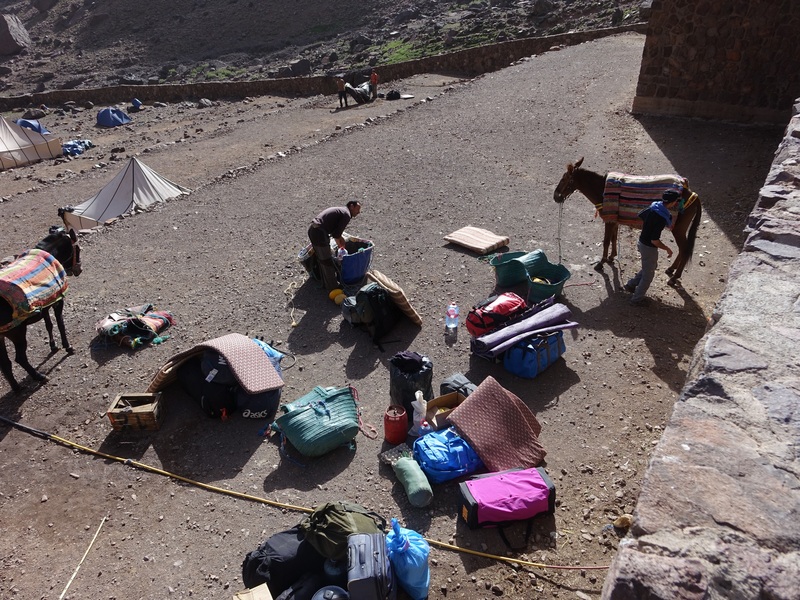 We took in last views of the Refuge area, and watched various groups packing up and donkeys being loaded. The descent was easy at first though I was glad to have poles to use. We had a brief stop at one of the stalls that line the route and removed one layer. 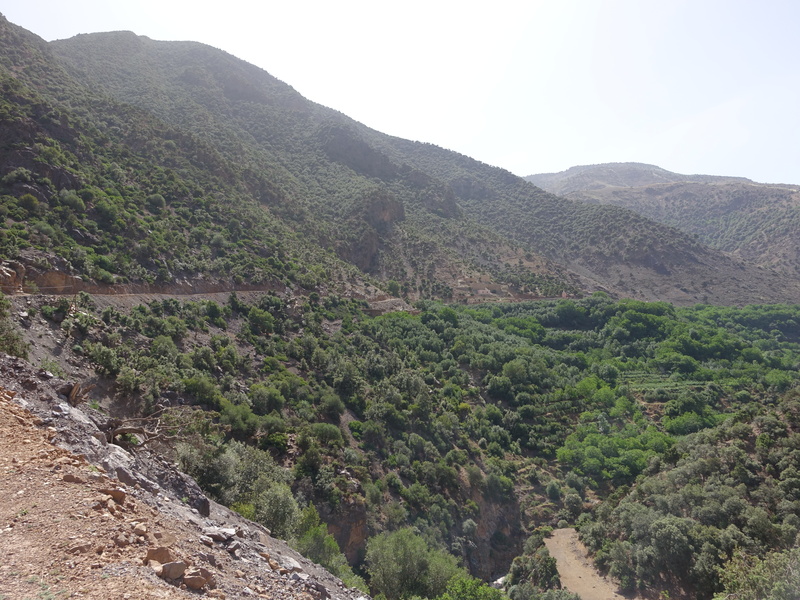 We were now on the main route to and from Toubkal. 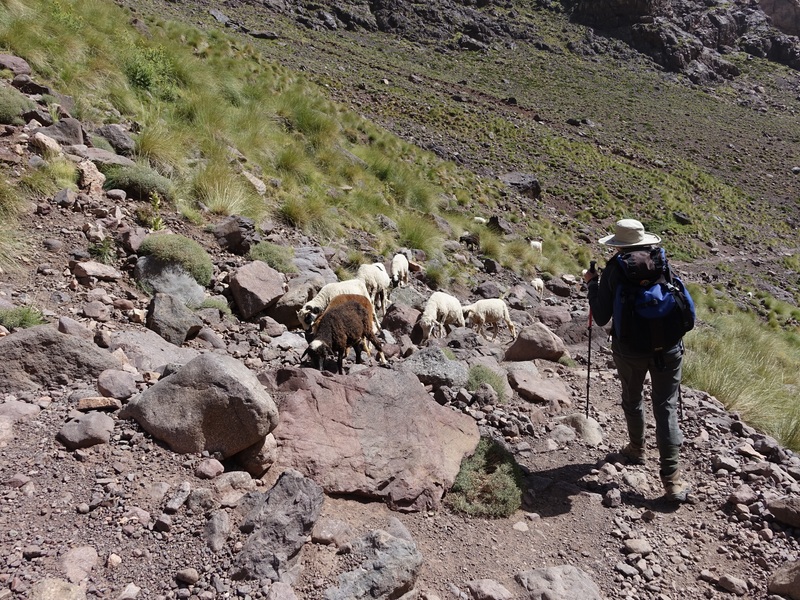 The track was full of donkeys going up and down, and there were numerous goats with their herders. It was over an hour from the stall to the next rest stop at a sanctuary. This section was tedious and wearing; I slipped on the gravelly track a number of times; I could tell it was going to happen each time but my legs were just too weary to prevent it. 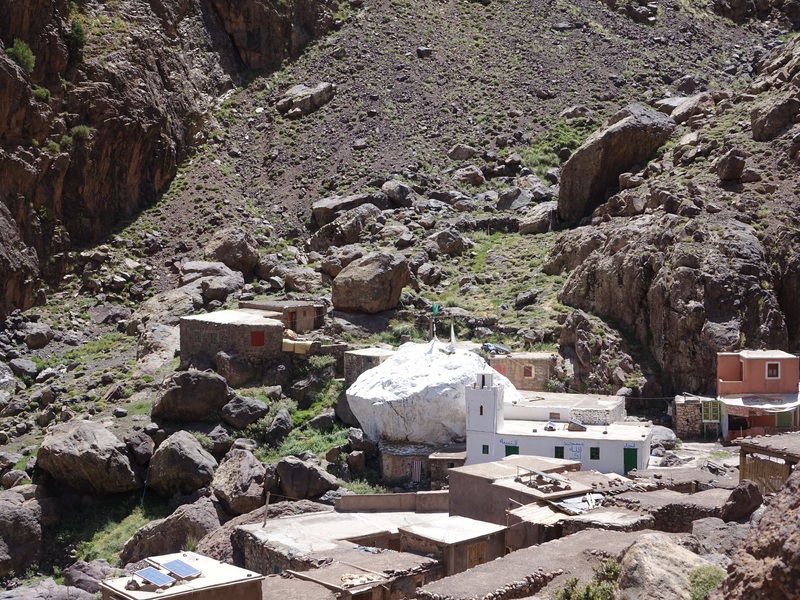 Eventually after 2 and a quarter hours we reached a sanctuary at Sidi Chamharouch, a small settlement, which the guide told us dismissively was a pagan one. 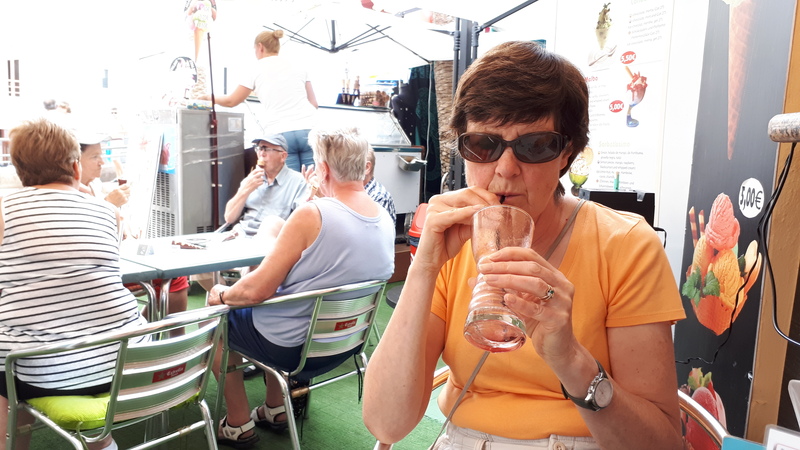 We stopped and rested indoors out of the fierce sun at a café and enjoyed another wonderfully refreshing fresh orange juice. From afar it had looked as if the sanctuary was down in a valley from which we would have to reascend. Thankfully this was not the case. The settlement merged timelessly into its surroundings. We were able to continue downward, plodding gently! 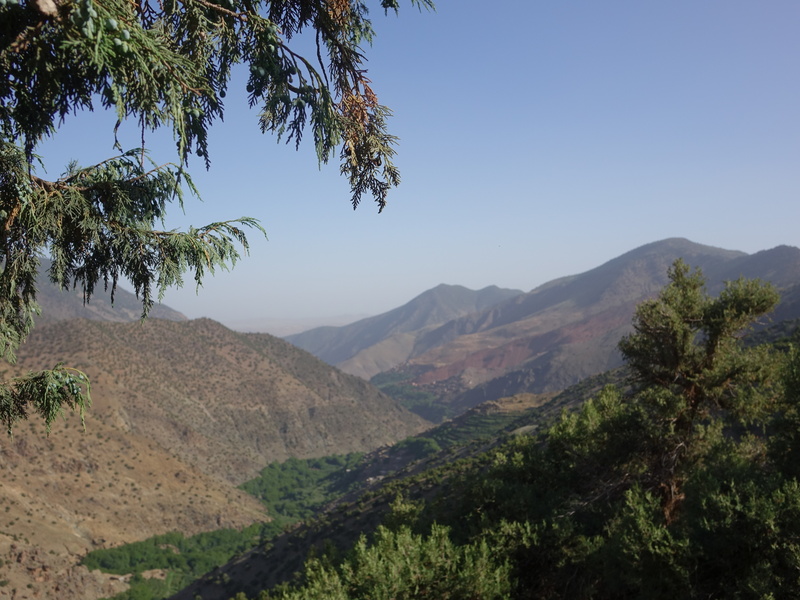 We passed a wooded area at the entrance to the Toubkal Park, and then across a large flat rocky plain into the village of Aroumd, an hour and a quarter from the sanctuary. Amazingly our hotel was one of the first buildings we came to in the village, the main part of which hugged the hill on the other side of the valley. Mohammed prepared his final lunch for us and then packed up his belongings onto his donkey and set off for his 3 hour ride to his own village. Is it all over yet? We had a quiet afternoon, relaxing, reading, watching others walk across the flat expanse and enter the village having made their way down the mountain. A football game commenced on a “pitch”…. just an area of the flat area amongst the rocks, with more and more children appearing and taking part. Our guide later gave us a quick tour of the village (his home) and we had a meal in the hotel then remained sitting outside and relaxing until sunset. The following morning we were ready at breakfast time, but the guy at the hotel obviously hadn’t set his alarm so eventually the guide appeared and got the cook and rustled up breakfast; more bread, jams and omelettes…..so I was very well nourished eating double portions since the other half doesn’t eat eggs . 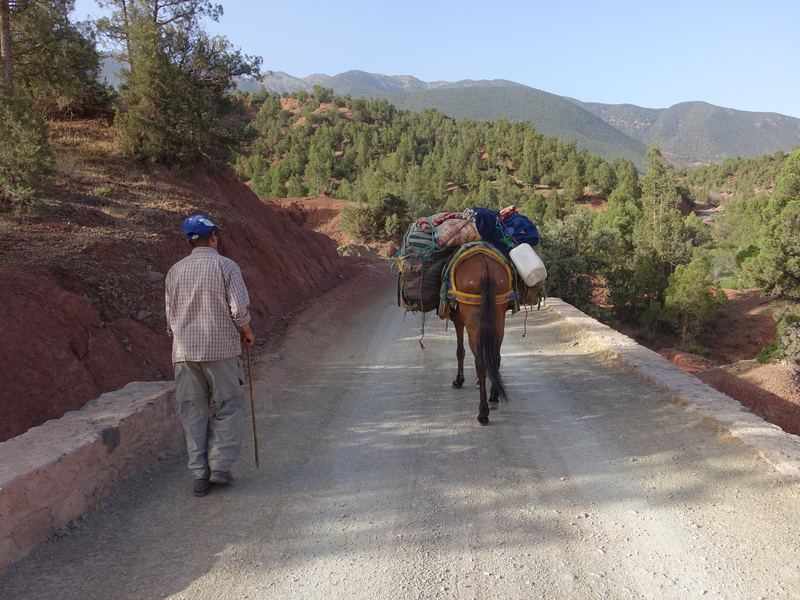 Another guy took our bags on his donkey and we set off with the guide to walk the 40 minutes to Imlil which is the road head from where we were driven back to Marrakech. 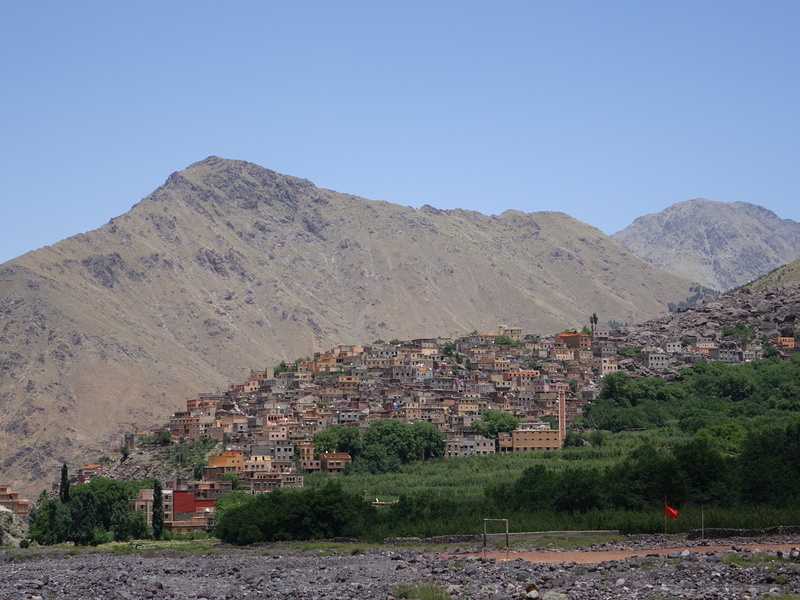 Imlil was busy, crowded, lots of tourists milling around, cafés and shops where the owners tried to hassle us to buy. 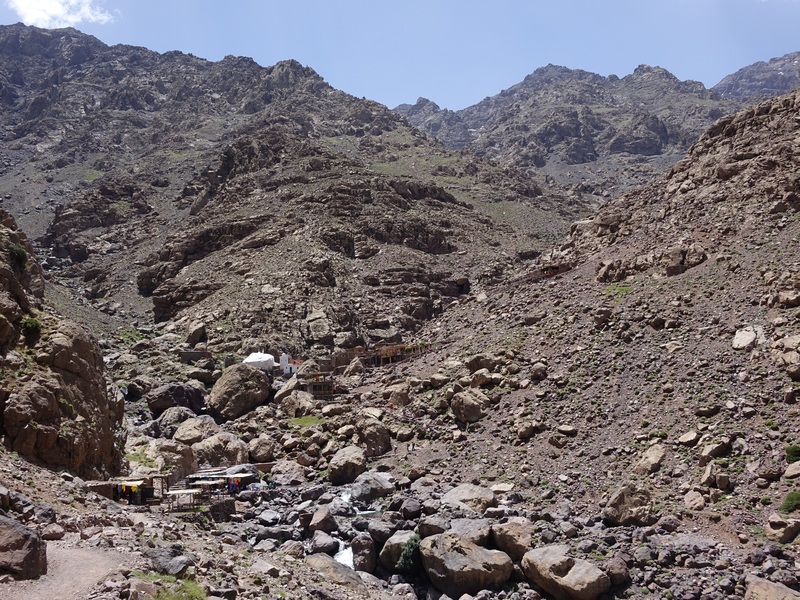 We were very glad that we had stayed the previous night in Aroumd rather than the more usual stop in Imlil. 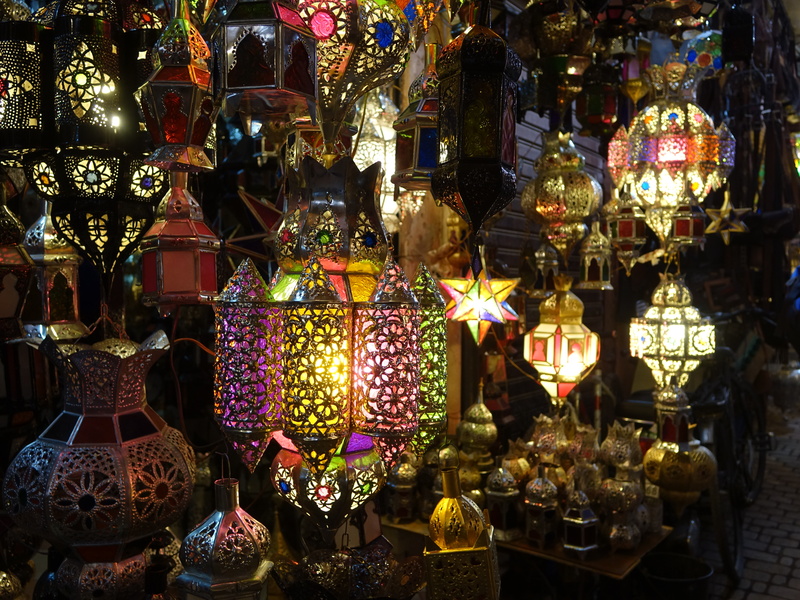 We only had the rest of the day to explore Marrakech as our flight out was late evening. Our driver kept our bags and arranged a pick up for the airport later. 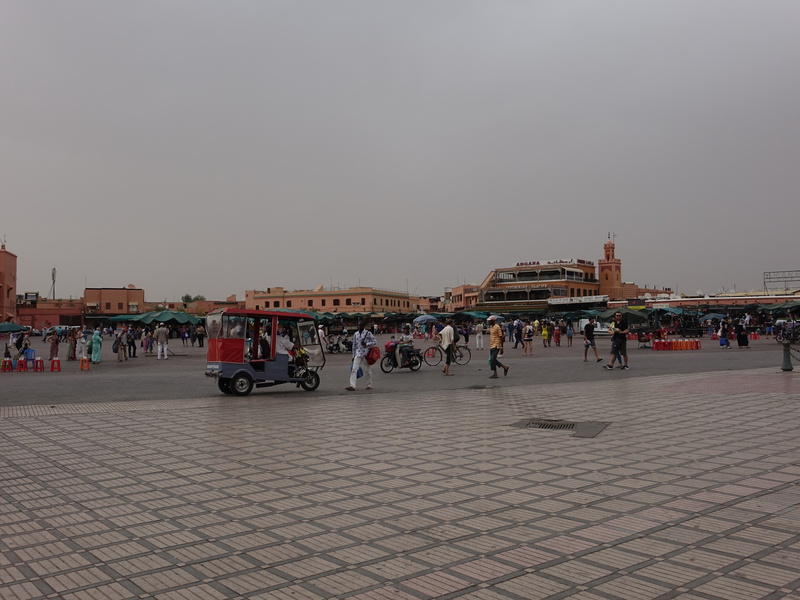 We were met by another guide and given a whistle stop walking tour of Marrakech, visiting the public square, Jemaa el-Fna mosque, the Madersa Ben Youssef, the old part of Town with its narrow alleys and various souks which were quite interesting but we were never going to buy anything. 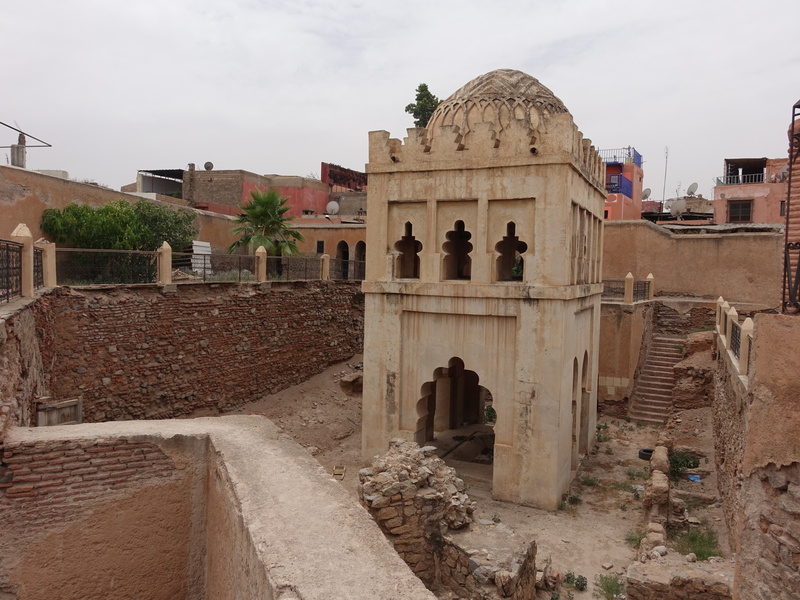 The city was incredibly busy, hot and humid, and we would not have wanted to explore by ourselves. Our tour ended and the guide left us at a very posh looking restaurant. It turned out not to be as expensive as it looked and we had lunch there, and more importantly lots of orange juice and soft drinks, and with the added bonus of wifi available so we could make contact with the outside world and I could tell the children I had survived and I would see them soon! We had a bit of free time but just sat around the main square watching the world go by, and going to cafés for more drinks. 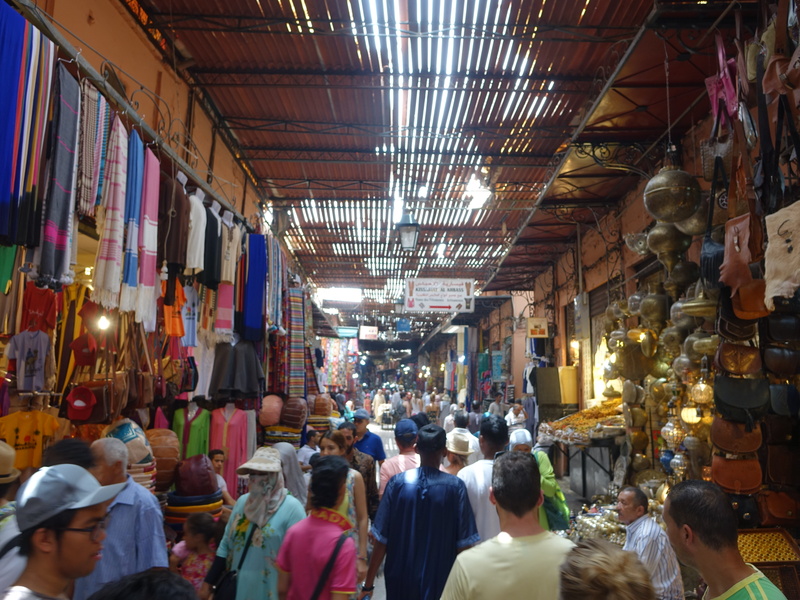 We couldn’t face looking around any more souks; it was extremely hot and humid, even for me – temperatures were well in excess of 40C. When the wind blew it felt even hotter. On this occasion I present my first guest post. My contributor will be known as the Reluctant Mountaineer. It is no secret to those who know me that I don’t really do cold and wet, unlike my other half. So whereas he is off up the mountains, in various weather conditions, my trips to high and jaggedy places are few and far between. 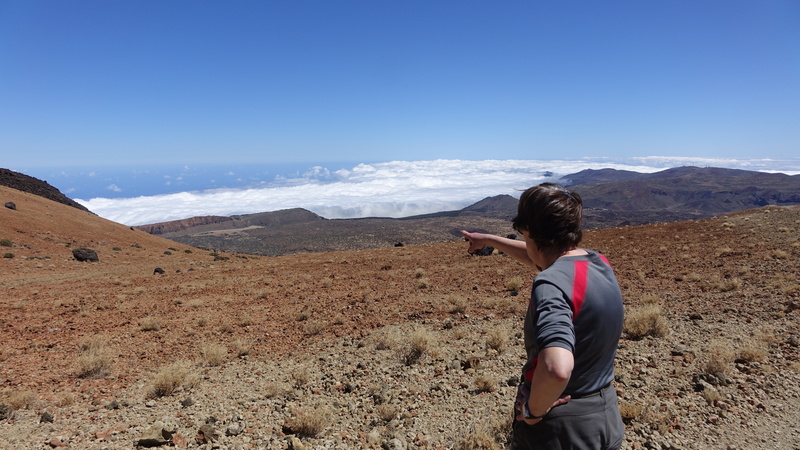 I agreed therefore to undertake an experience of climbing a volcano if I could do so in warm and sunny conditions, and be rewarded afterwards by being able to enjoy some R&R in said conditions. Research was undertaken (by my other half), some training done and a Jet2 holiday booked to Tenerife for September. Don’t be fooled, it wasn’t a Jet2 holiday as the brochures would describe, but the easiest and most cost efficient way of making the trip. On arrival at our hotel on the Thursday evening we informed the receptionist that we would not in fact be in the hotel the following night since we would be in a mountain refuge; surprisingly she did not seem fazed by this. 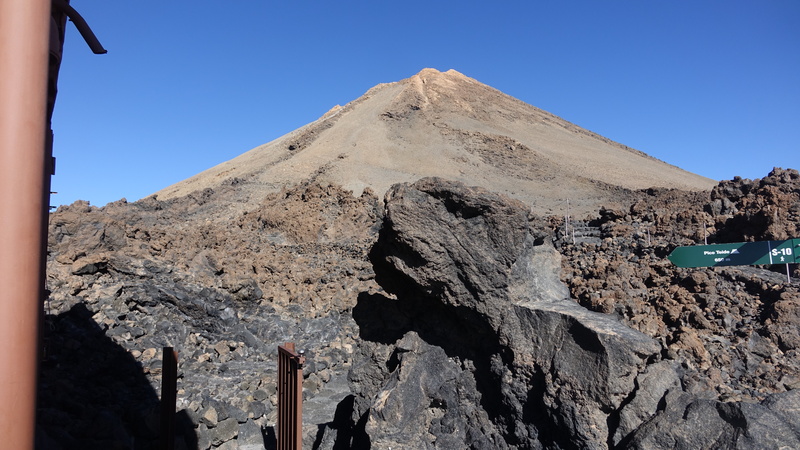 Our objective was Pico del Teide (highest point on the island, and indeed in Spain, at 3718 metres). The following morning after breakfast we packed up and found the bus stop for the Titsa bus (no sniggering please!) 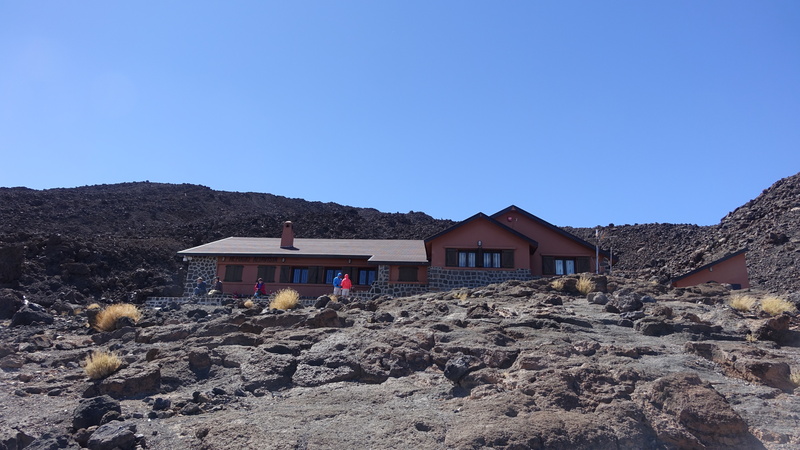 to the Montaña Blanca stop in Teide National Park. There is only one service each way a day so we were early at the bus stop so as not to miss it. We were not planning to make the ascent the easiest way. 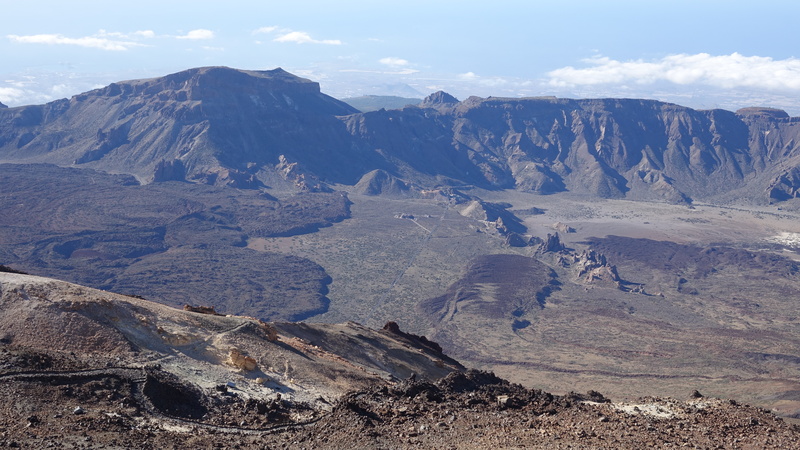 This would be from the Teleférico del Teide (a cable car) which takes you up to 3500m, and a good job too as it was out of action due to high winds) nor the hardest way…..up and down in a day (too much for me to contemplate). 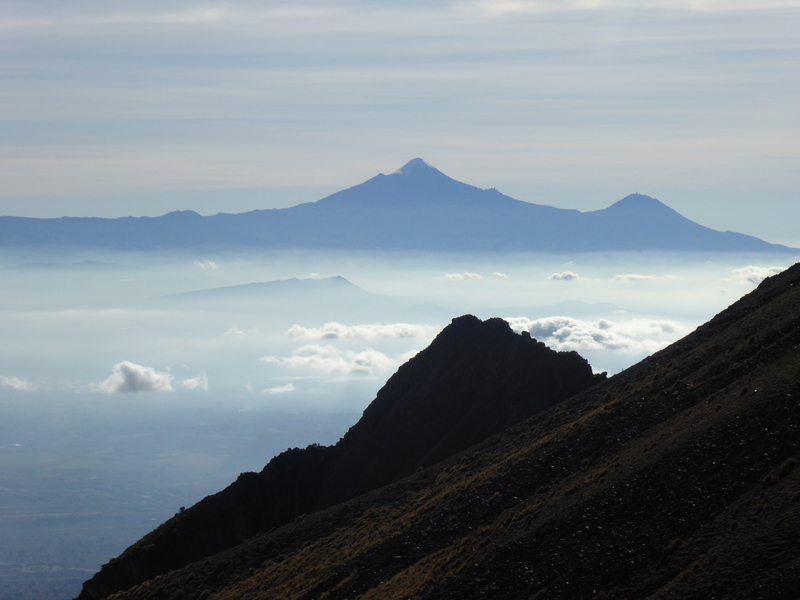 Our plan was an ascent which would show us more of the mountain scenery, but break the ascent into two days. 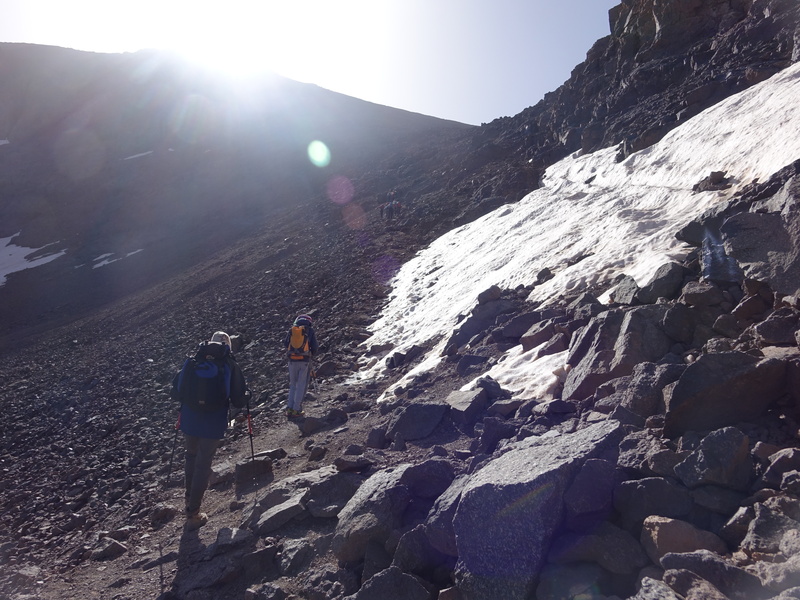 On the first day we would ascend to the Refugio Altavista. 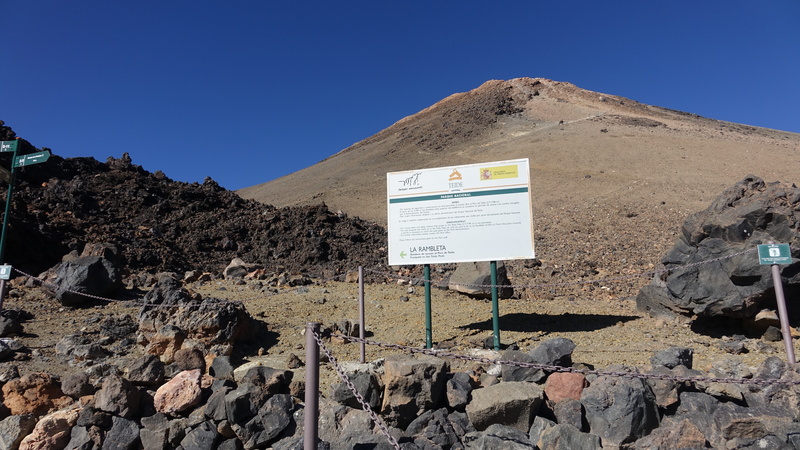 The next morning we would ascend/complete the climb to the summit of Teide, and then descend the same way and to catch the (only) bus back to Los Cristianos at 3:30 pm. We started walking at 11:15am and the first hour and a half was easy along a vehicular track, and a steady incline. It gave us chance to appreciate the weird, colourful scenery which at times gave the appearance of an alien planet. 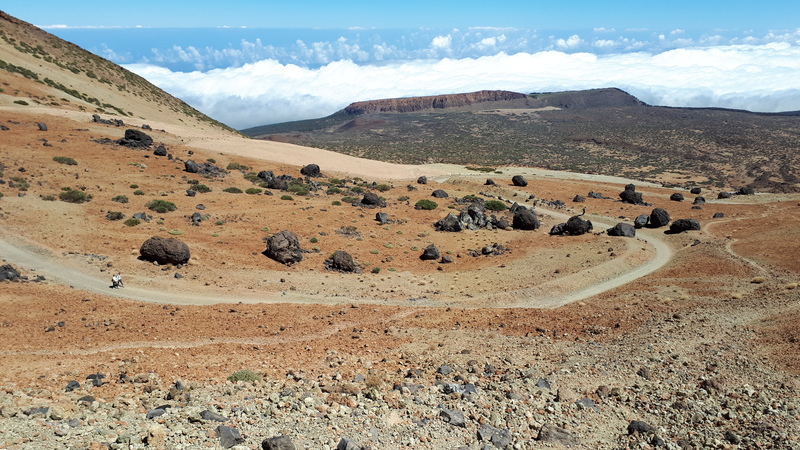 We also passed by the Huevos del Teide (Teide’s eggs), boulders created by pieces of lava detaching from the lava flow and rolling downhill and gathering more lava as they do so. They are accretionary lava balls. At the end of the track we had half an hour rest and ate lunch, in the company of numerous lizards darting in and out of the rocks. 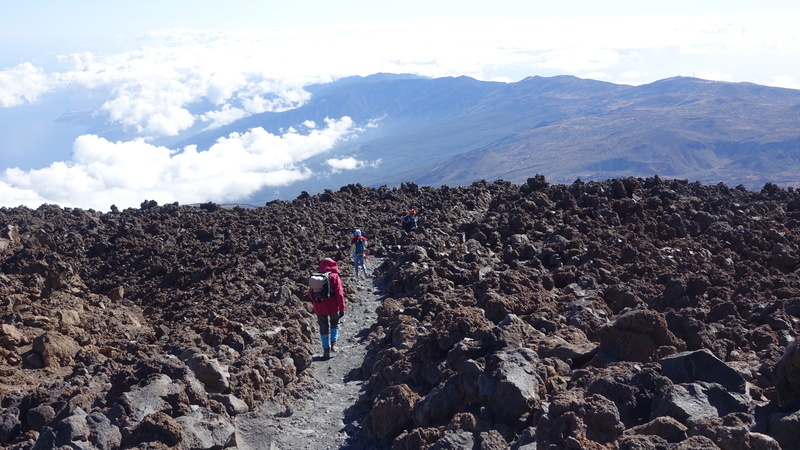 Above us rose, more steeply, a rough lava covered slope which we were to ascend. 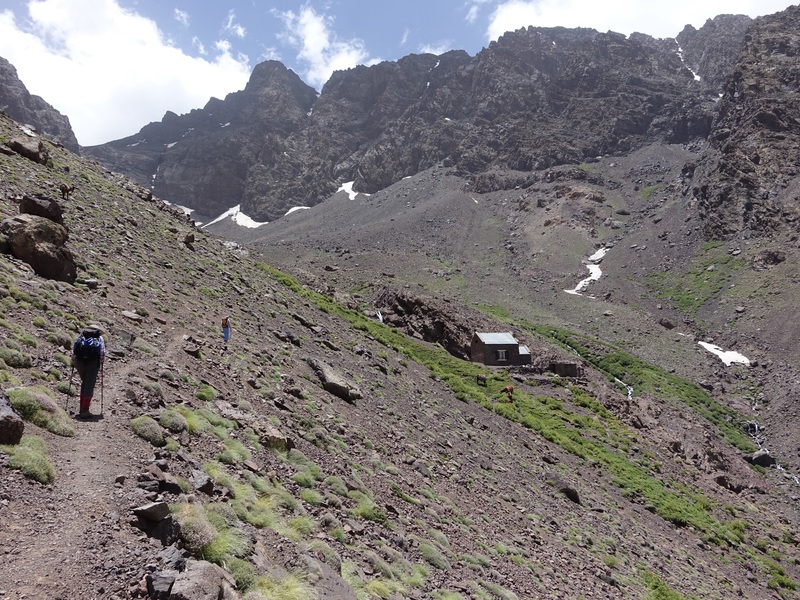 I had expected another hour and a half to the Refuge but it took 2 hours 10 mins of unrelenting ascent. Yes, I know it is a mountain, and they tend to rise upwards. But even when the path took numerous zig zags it did not seem to alleviate the gradient; every zig and every zag was relentlessly uphill, and I may have voiced my frustration at times! However, it was warm and sunny, so I probably should not have complained as much as I did. 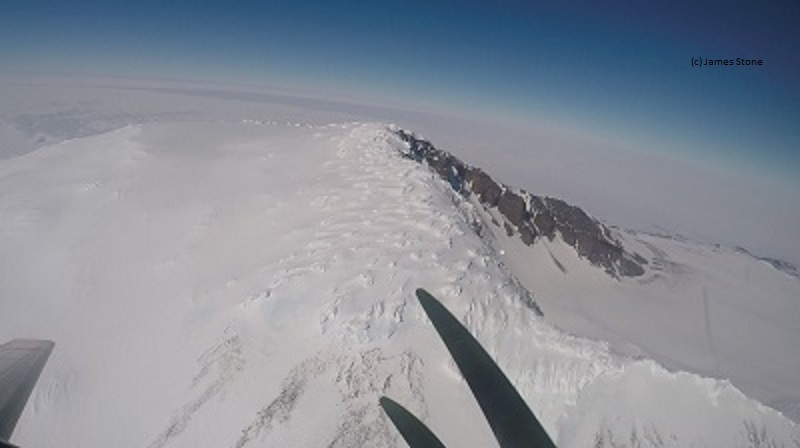 [Editor’s note – I did remark at the time at how different the atmosphere was from other peaks I had climbed. The air was blue!] 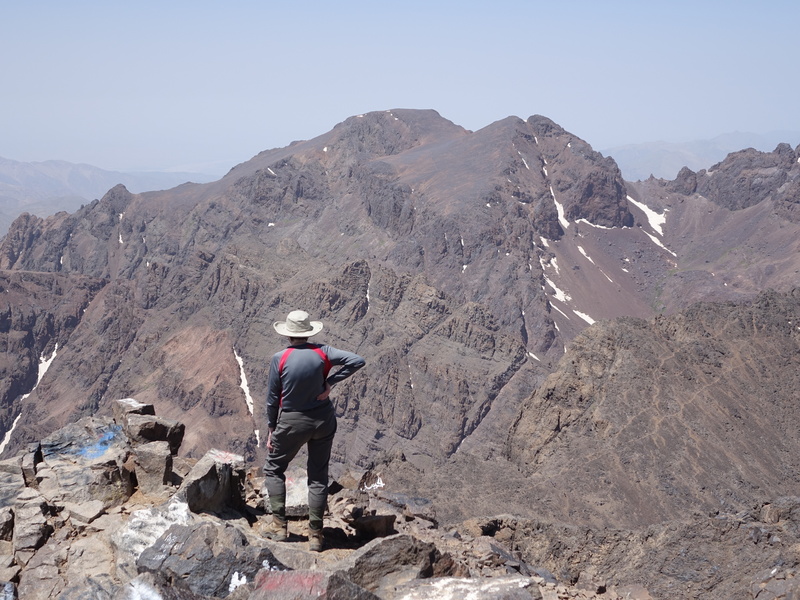 And we had plenty of time to reach the Refuge, so I felt justified in taking breaks and admiring the views and the scenery. On arriving at the Refuge we took in the expansive views, and I tried to regain feeling in my fingers which had gone numb with the cold despite the pleasant conditions. Eventually we went inside to warm up. The Refuge main area was open, but checking in and access to dormitories and kitchen is not available until 5 pm. As soon as we could we made a warming hot chocolate, and then “enjoyed” a reconstituted meal. The other half was actually feeling worse than me, having developed a dull headache already, and was struggling to eat; so I had the sticky toffee pudding all to myself! 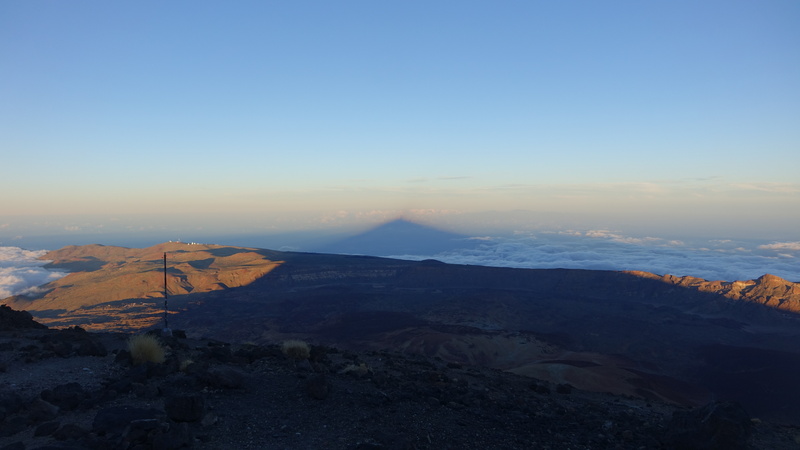 As the sun went down we enjoyed spectacular sunset views, including seeing the shadow of the mountain on the clouds. The drop in temperature, the prospect of an early start the following morning, and developing headache in my case now, all contributed to bedtime by 9:30. The dormitory was full and stuffy, and sleep was disturbed, as is often the case at altitude. We were awake early, along with everyone in the Refuge. Our headaches had abated. We emerged rather slowly; not as early a start as perhaps my slave driver other half had planned; but we got ready at a pace which we were comfortable with. The Refuge was packed and busy in the bathrooms and kitchen. After porridge and more hot chocolate we packed up and set out. We were probably the last to leave the Refuge, though it was only 6:30 am and still dark. 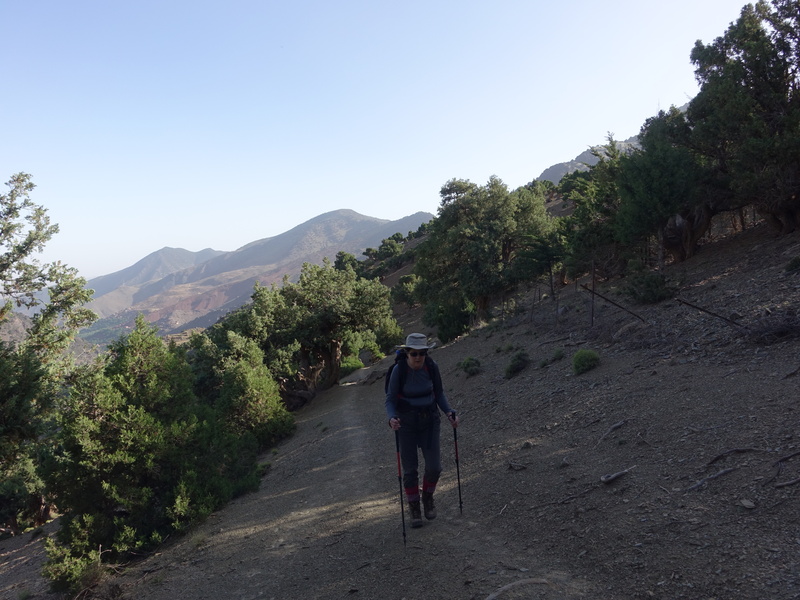 I was confident I would be the slowest person making the ascent that morning, and the last to reach the summit, so setting off last wasn’t a problem; better than being demoralized when everyone overtook me. Our only time constraint was being back on the road in time for the bus in the afternoon. 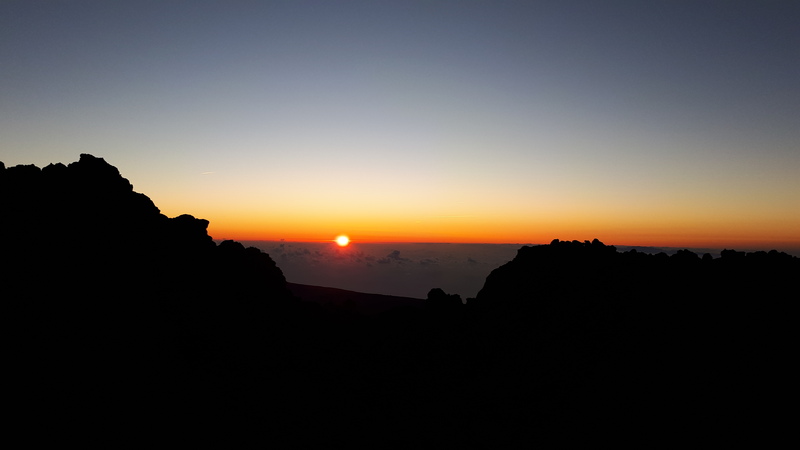 The early risers were trying to reach the summit for sunrise. 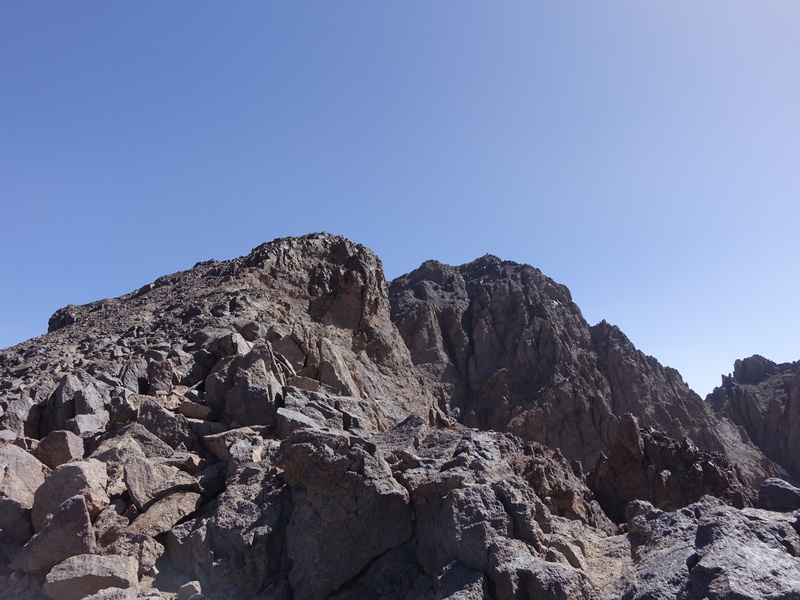 I had that experience on Mount Sinai, so didn’t feel I was missing out. I prefer sunsets…….not a morning person! We were well wrapped up against the cold, and using head torches for about 50 minutes. I knew this would be necessary, and had been somewhat concerned, my eyesight not being brilliant, and I had a fear of tripping up. In the event it was not as bad as I had imagined, though my pace was very slow. The next hour was the worst, a long, tedious, unrelenting ascent. It was relieved only by the nice sunrise. 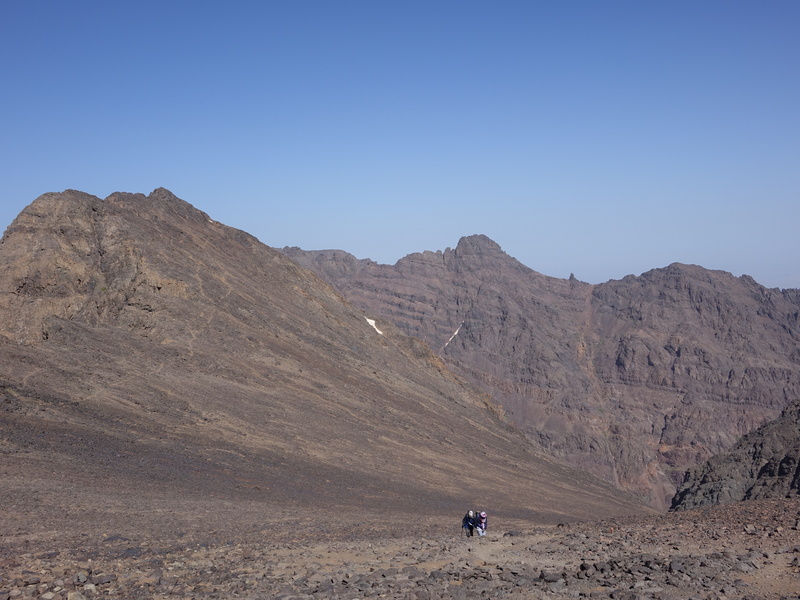 Time estimates for the ascent from the Refuge to the summit were one and a half to two hours. No way would I achieve one and a half, but clearly two hours was also beyond me. My slow pace was obviously bothering my other half since he took my rucksack for most of this section, carrying it as well as his own; and I took the large camera. I knew we would pass the Teleférico station, and the object was to do that before 9am when guards would arrive to check if one had the appropriate permit to ascend on that day at that time. By staying at the Refuge one avoids the need for such a permit, since you are beyond the check point early; another reason for the early start. I had (mistakenly) thought the Teleférico station was about half way to the summit. So I was increasingly frustrated, and concerned about the time as I plodded along. We had seen the sunrise, the light was increasing, though the predicted winds were strong, and annoying. I was very close to a toddler “are we nearly there yet?” tantrum. Eventually we saw and then reached the cable car station. It was now properly light, and getting warmer. We had a 10 minute break to fuel up, exchange the rucksack for camera and gird our loins for the final ascent. Although it was demoralizing that we saw so many people on their way down (so clearly we were the last), when I reached this point I finally felt confident that I would make it to the summit. 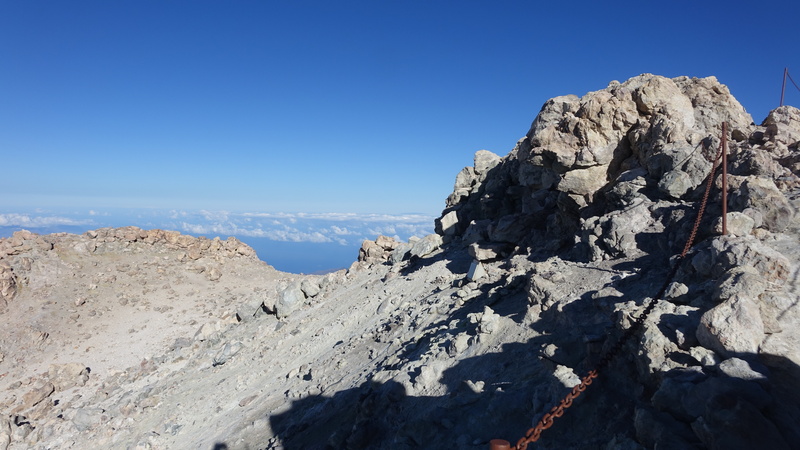 We had been able to see the summit for a while, but now it felt within reach. I thought, and hoped, it would take a further 45 minutes. So it was slightly disappointing that the final climb took an hour. This was probably partly due to the wind, which was gusting to 80 km/hour. At times you just simply had to stop and brace yourself against it. The terrain was bouldery, and still relentlessly up and up. In places near the top there were chains for support, which helped with the ascent, and as an anchor in the windy conditions. Whiffs of sulphur punctuated the air. We could see some monitoring equipment in the crater. Finally, the summit, a small rocky crest. Relief! Hooray! Not sure which was the predominant feeling. Although the views were expansive the windy conditions and cool temperature made it pretty unpleasant. My sense of achievement was brief. I quickly took in the views. But then my overriding thought was to get down off the mountain. Unsurprisingly we made much faster progress on the descent! 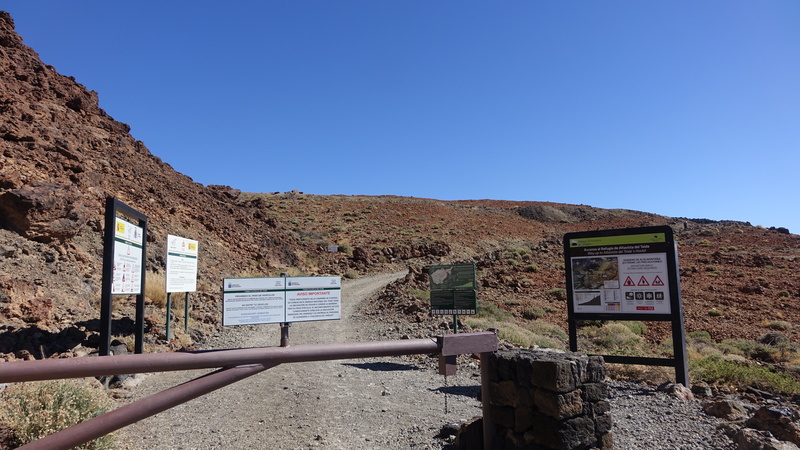 Half an hour back to the Teleférico station where there was no sign of activity. Clearly the winds were again too high for the Teleférico to be operating. Just under an hour back to the Refuge, where we had a pause, and stripped off some layers of clothing. The warm and sunny conditions returned and we descended the zig zags with ease; stopped to eat and renew our acquaintance with the lizards; passed numerous people slogging their way up; and made our way back along the track, wearily, but with a sense of growing satisfaction and a sense of wonder at the amazing landscape. 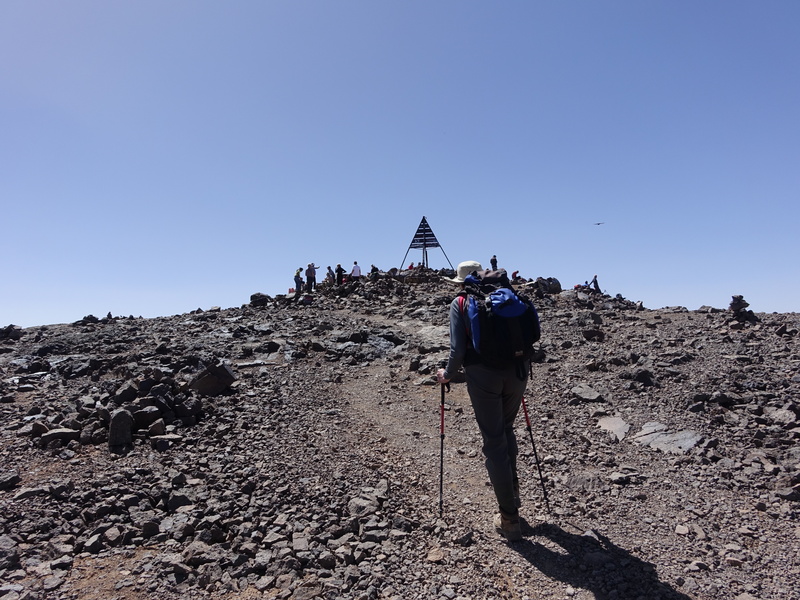 The route we had taken does enable you to appreciate the whole mountain. Are we nearly down yet? 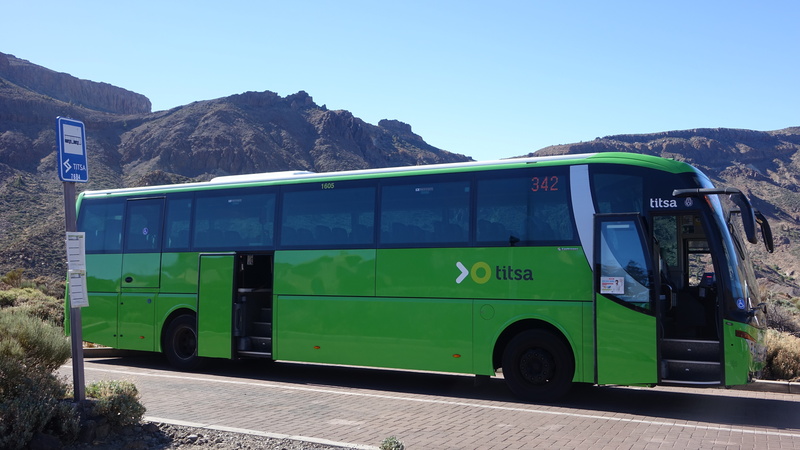 We arrived at the roadside an hour early for the bus which transported us back to Los Cristianos….for a welcome nap [Editor’s note – if that is what you call two hours of unconsciousness], shower and dinner. We were able to sunbathe by the side of the road as it was very warm, and with strong sunlight. The following day we were sunbathing in the comfort of loungers beside the roof top pool of our hotel……going up and down the stairs to get there was decidedly less comfortable! Later we explored the town, and the water front, with frequent stops for drinks; always good to rehydrate after mountaineering isn’t it? And beer and Manhattan cocktail definitely help don’t they? ?